Whoops, yes we are home, in fact today the Turkish Kilim has been put up on the wall, invoking fond memories of Selcuk…. So here is the trip tally. Nine years ago when we travelled in our house bus we should have kept one. I only thought this after we were accidently caught up in not just one , but two Crime Scene Investigations. It seemed a unique category. This time the trip started with two punctures….and no more after that. Still it was the very first thing on the list…. – 2 soap dishes, with soap, 2 watches, sunglasses, lipbalm, computer charging cord – this was only temporarily lost as it was kindly put on a bus and caught up with us, Ollies new knife he accidently carried through customs, but we did replace it, one Turkish spinning top – a Topac – well used for months by Charlie. 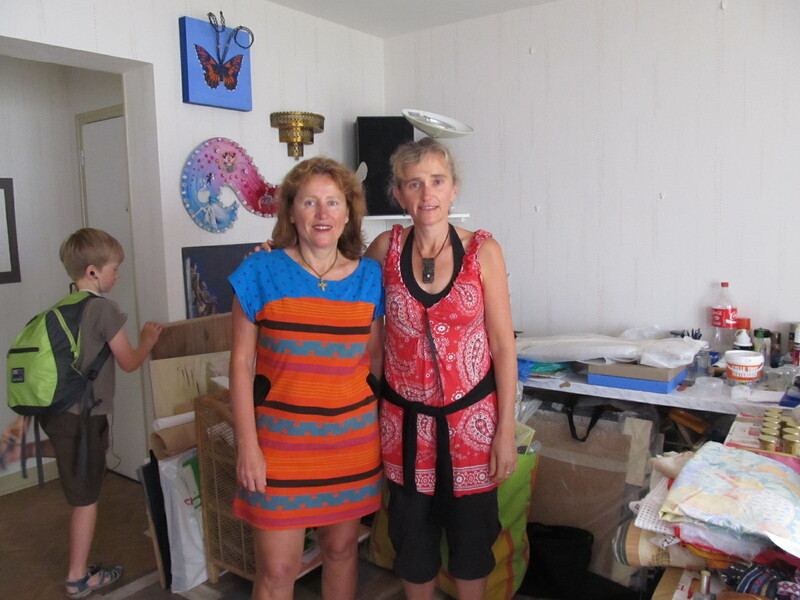 We were delighted to find some brand new ones we had sent home with the kilim. 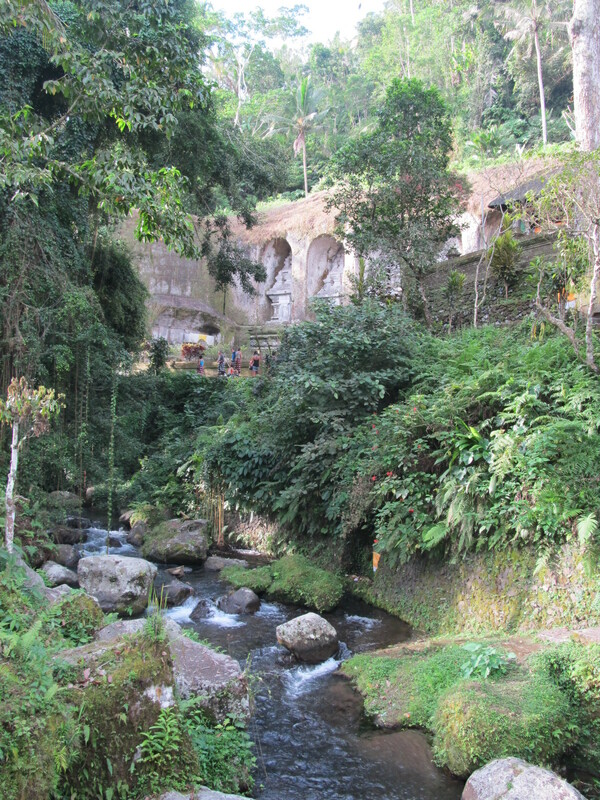 Bali is known as the land of 1000 temples and yes there are beautiful, stone carved, moss covered temples in the jungle…. in fact everywhere. Most people have a private temple at home too, which makes for a grand street frontage. 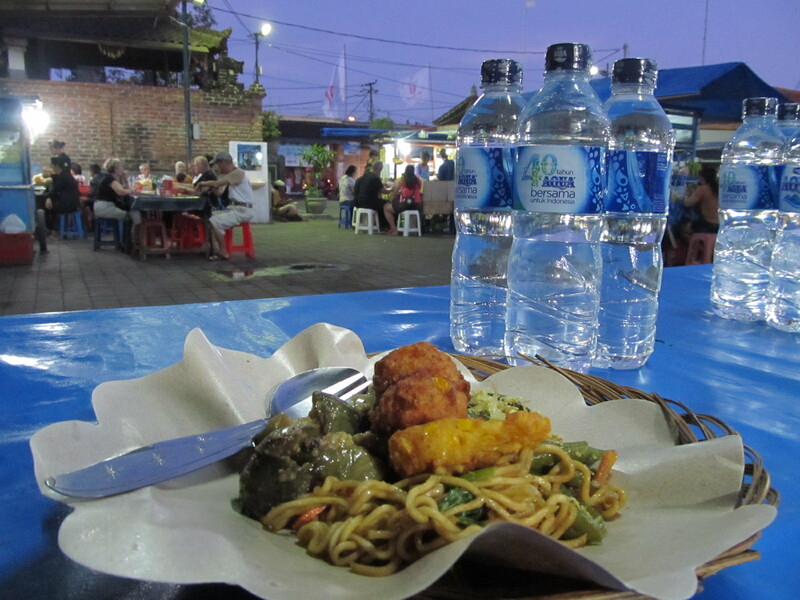 The land of 1000 statues, the land of 1000 massage hawkers, sarong shops, resturants and Warung (food stalls) and the land of 1000 offerings. 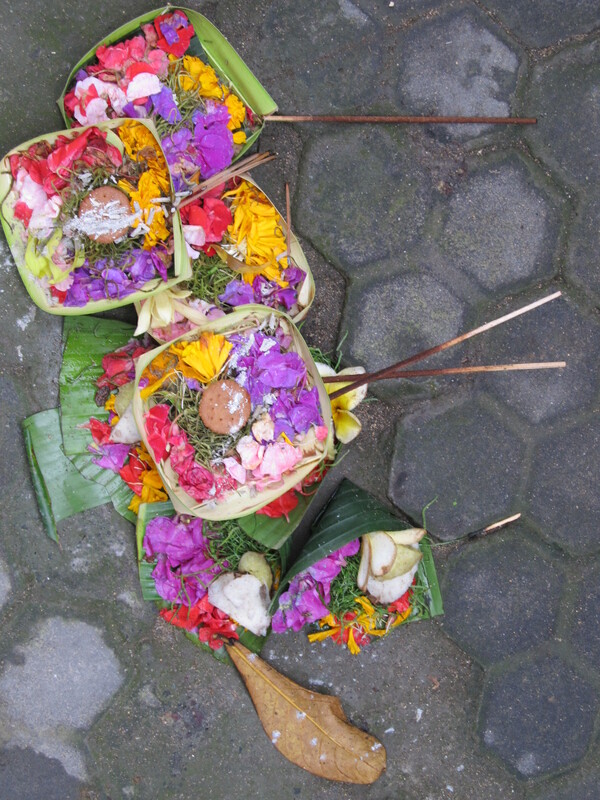 Offerings are constantly being made by Balinese women. 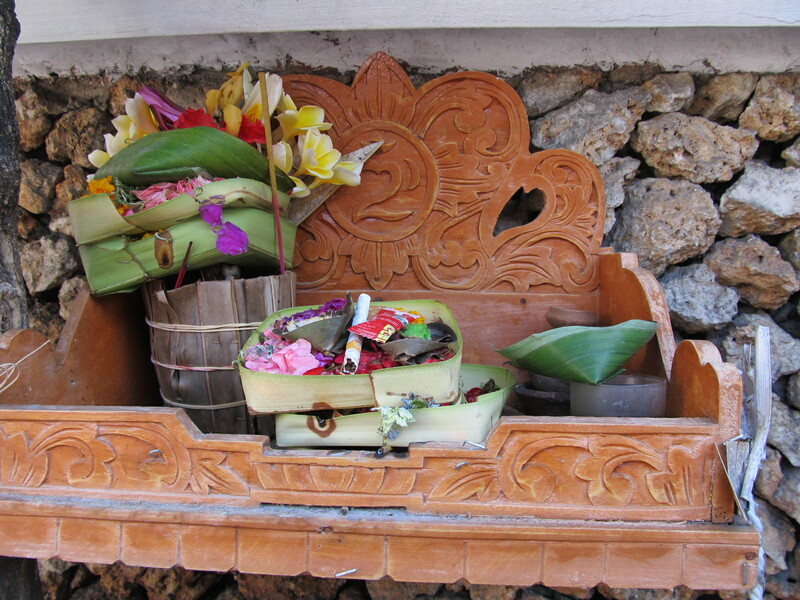 They consist of little woven leaf baskets filled invitingly with flowers (frangipani, my favourite), leaves, fruit, tiny morsels of cooked food, money and even cigarettes (unsmoked). 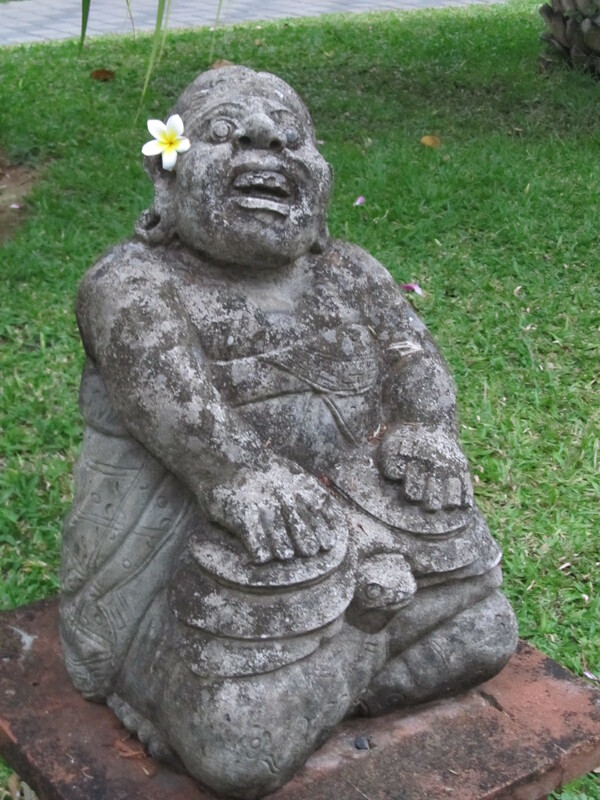 Throughout the day they are left on steps, in doorways, on statues, in temples, on the dashboard of a car or taxi. They do fall over, get trodden on and wilt as the day goes on, but they are cleaned up and replaced so often you hardly notice. 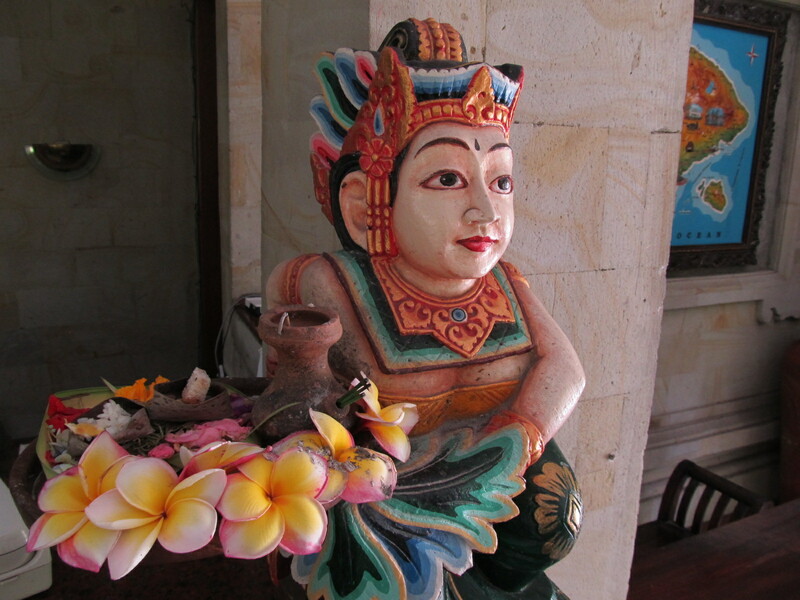 It provides a lovely backdrop to Bali, these tiny works of art. 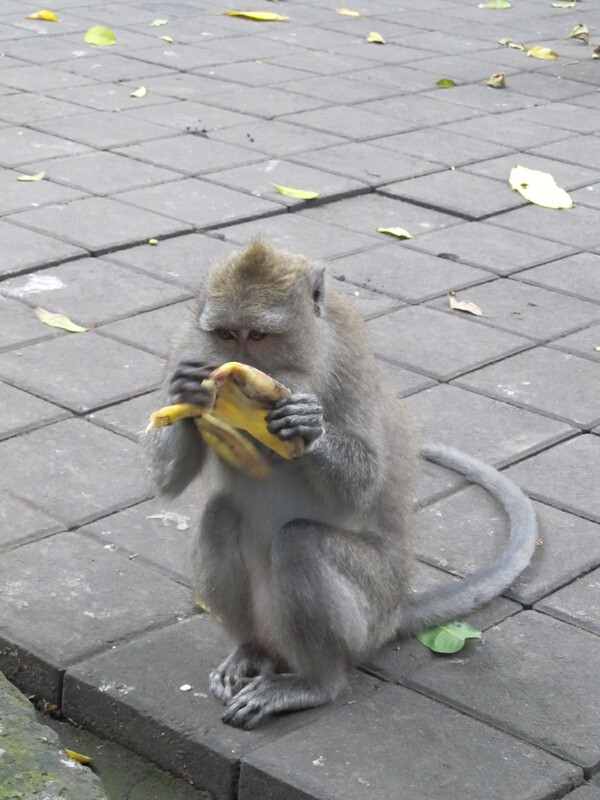 Bali is mostly a Hindu country, unlike the rest of Indonesia which is largely Muslim and can be very disapproving of ‘lil old Bali with its liberal, laid back vibe. 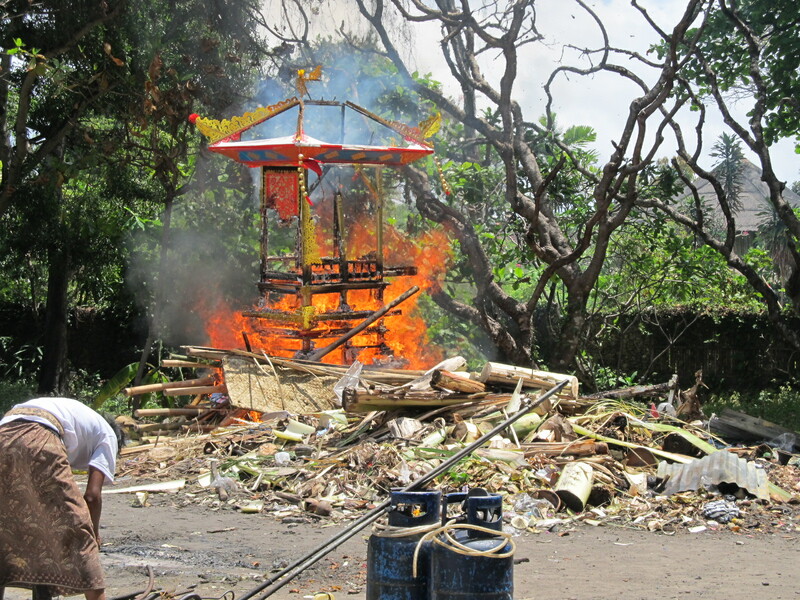 Here we walked into a cremation ceremony, basically a huge fire in a carpark, with food tents set up for the mourners. There was a coffin on the fire, then this larger, fancier one was set alight. It was very relaxed and nobody minded us taking photos. The ashes are scattered out at sea. 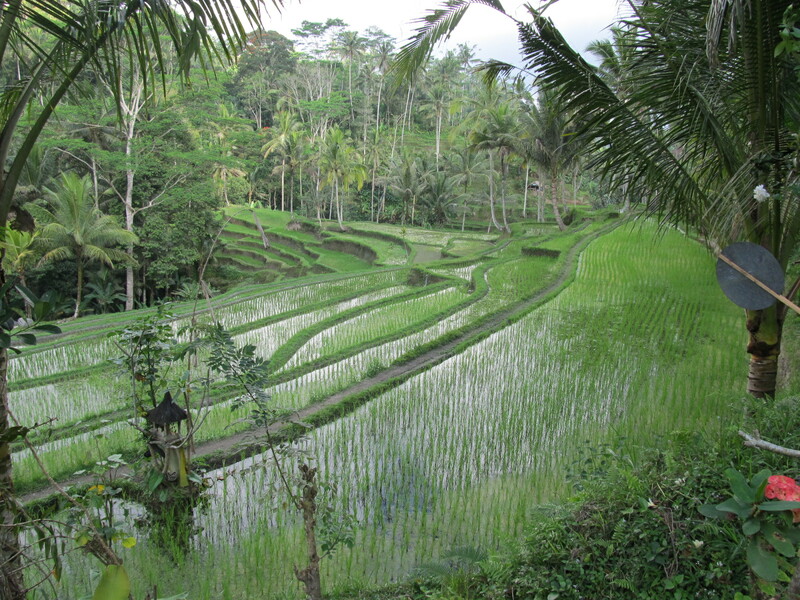 Although tiny – you can drive around it in just 12 hours – Bali boasts the same population as New Zealand – 4 million. 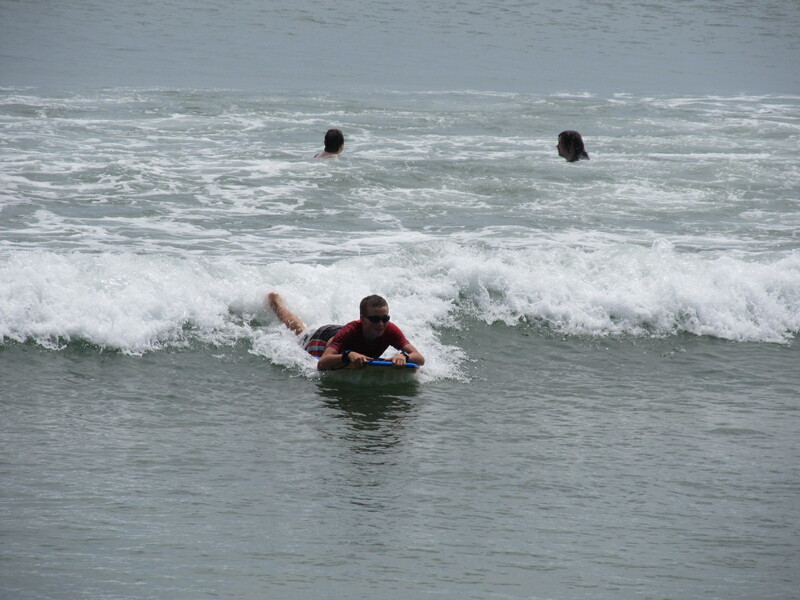 With the influx of tourists you would think it crowded, but with the exception of Kuta (the original surf town and manic tourist mecca) there is an un hurried feel here in Bali. Even with the thousands of motorbikes on the road and taxis, there is no stress, everyone is very laid back, happy and accepting of each other. I am beginning to think that ‘road rage’ is a kiwi invention only. People go about their business with respect for others. There is very little crime. We were stopped twice when out driving around the island by police on a routine check. Our driver smiled and tucked some money into his licence, handed it over and on we went. 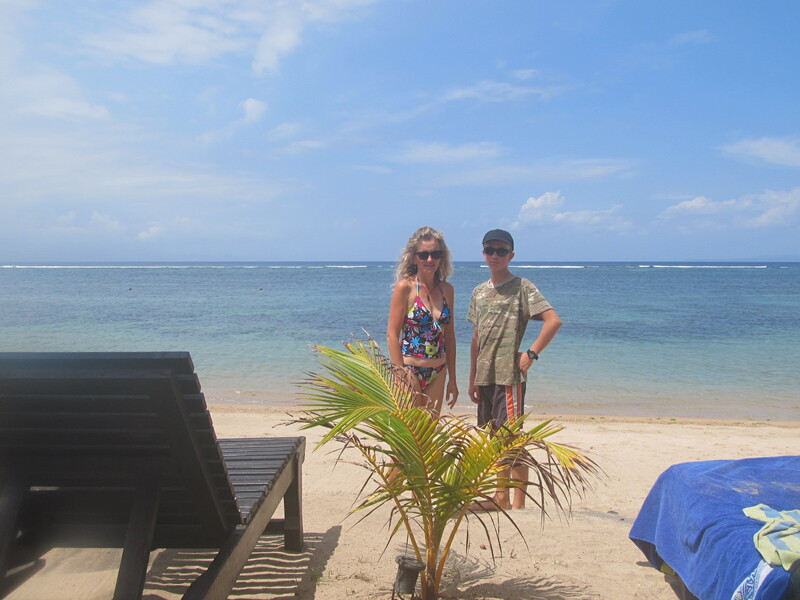 We have stayed in Sanur Beach a beautiful 5km stretch of beach – reef protected – with a paved cycle/walkway running it’s length. This is lined with resturants and hotels, tables and sun loungers on the beach, flags, lanterns at night, coconut trees…..It is truly beautiful. We are staying in a tropical garden with our own palace. It is peaceful, quiet, tranquility personified. 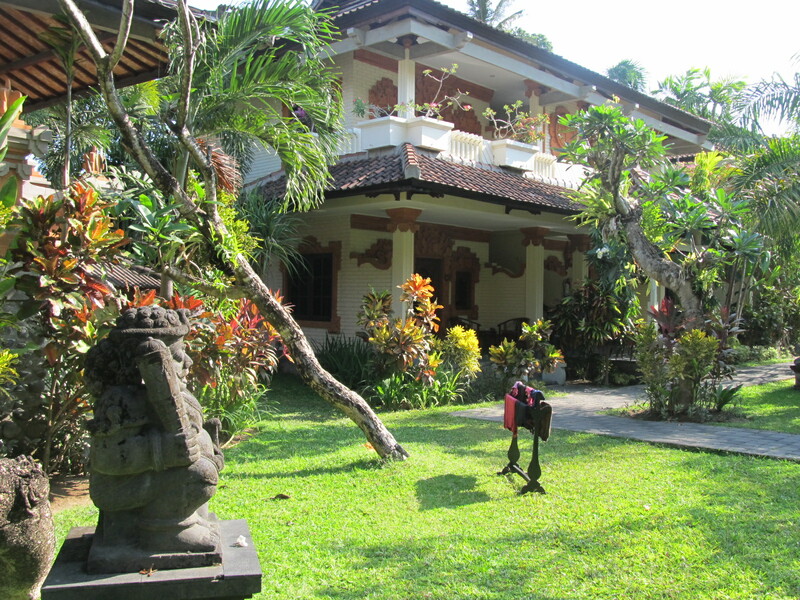 We swim in the pool and the sea, laze on sun loungers, have our room cleaned everyday by gentle smiling Balinese men. 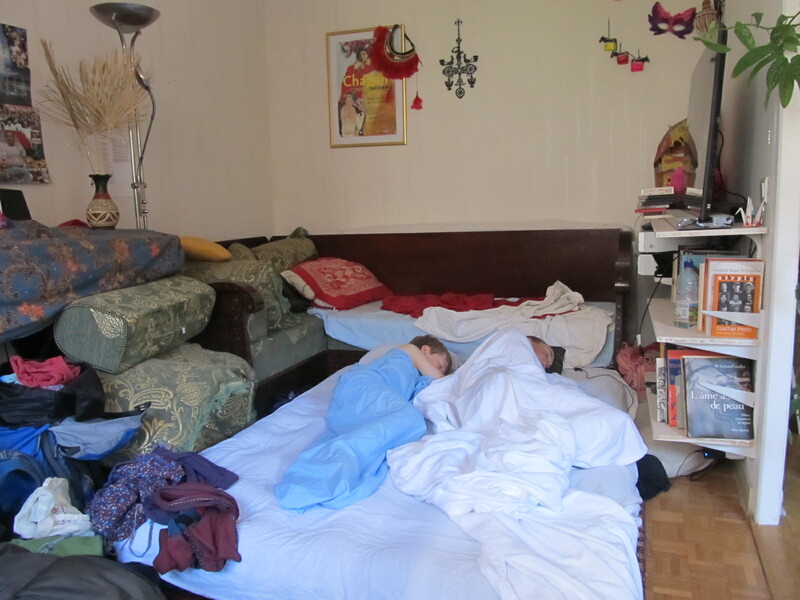 There is a huge buffet breakfast – Ollie needs to set his alarm so as not to miss this, even Charlie complained about it finishing as early as 10am….We are truly on “island time”. 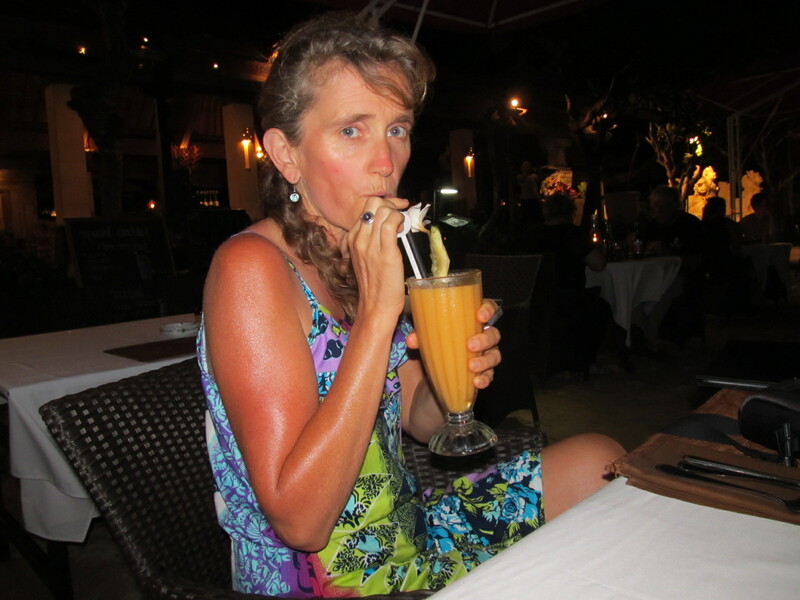 Otherwise it is a whole lot of tropical fruit – watermelon, papaya, pineapple, fresh juices -mango being a favourite of the boys. It is the perfect temperature for me too, 25 degrees at night, about 30 in the day, boiling in the sun, but plenty of shade, cool drinks, air con and water to swim in. I love the night time culture. Ollie is in heaven too. It is dark at 6.30pm every night with shops and resturants open until 11pm. 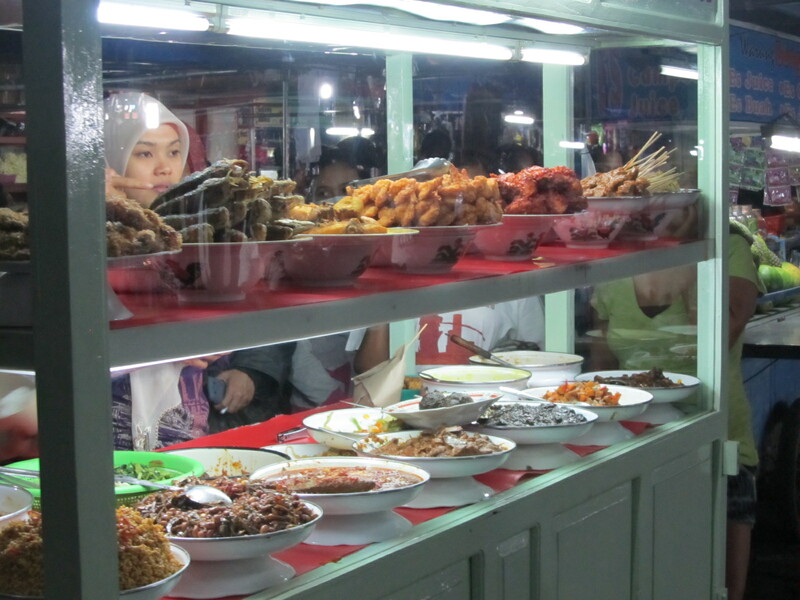 Getting food at the night market is a delight, pancakes which can be filled with chocolate, banana, peanuts, cheese – and a mixture of them all. This plate of vegetarian yumminess was only $1, so we ended up having 3! I have been enjoying massages at the in-house spa here, a very unusual experience for me and one I could get used to. 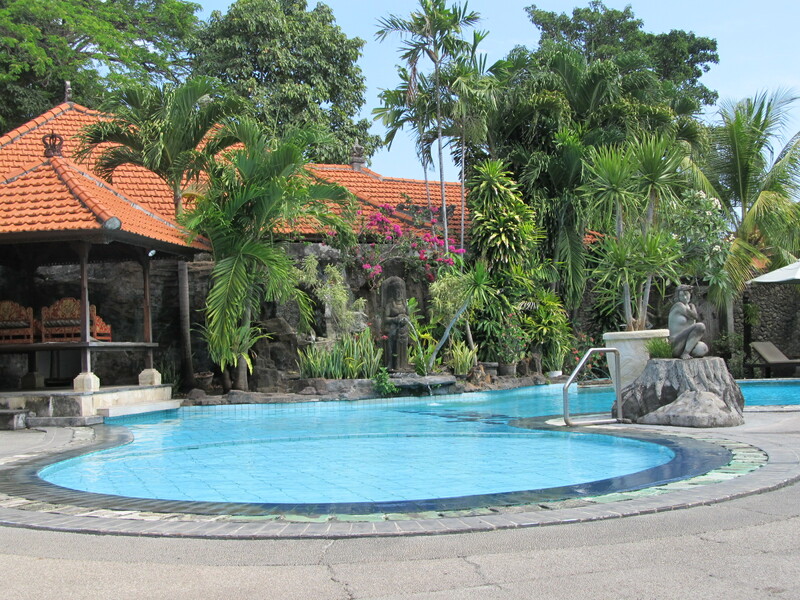 Although massages are available everywhere it is luxury to wander just a few paces to an open air pavilion next to the pool and for less than $10 get a massage. So far I have had a facial, a reflexology/foot massage, a Balinese full body massage and I am considering what to celebrate with tonight, our last night….A foot masage and pedicure perhaps? Yep I went for the pedicure with flowers painted in my toenails. Ollie had a back massage last night, a real treat for him as he is a very tactile person, touch is definitely his ‘love language’ and he often asks for a massage at home. 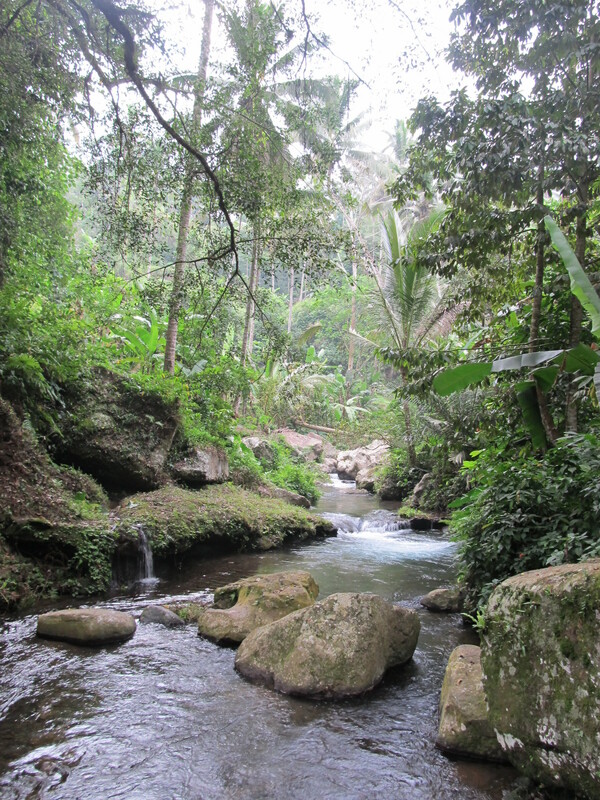 We had a big day out exploring, just the typical tourist trail but still a delight for us first-timers to Bali. We saw a traditional theatre performance, amazing costumes and masks with a full live gamelan orschestra. 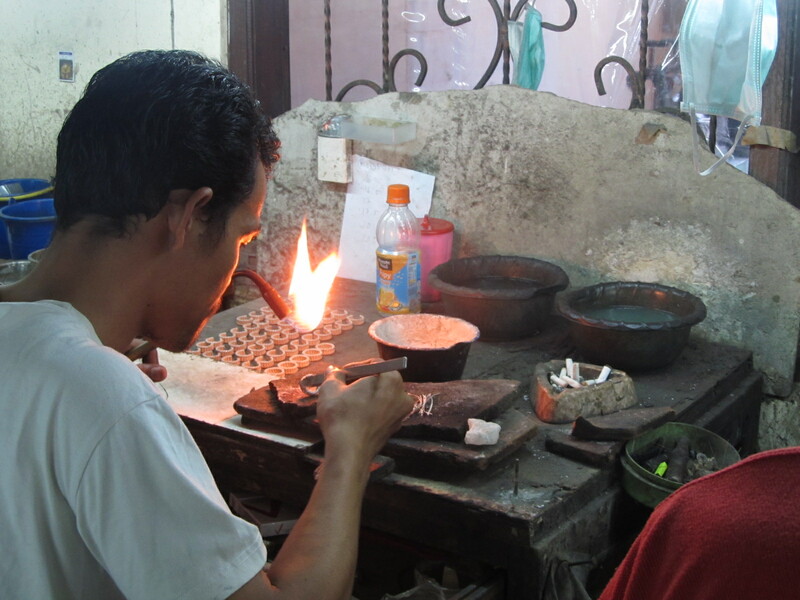 We visited a silver factory and saw silver being melted down and shaped before visiting a couple of silver shops. 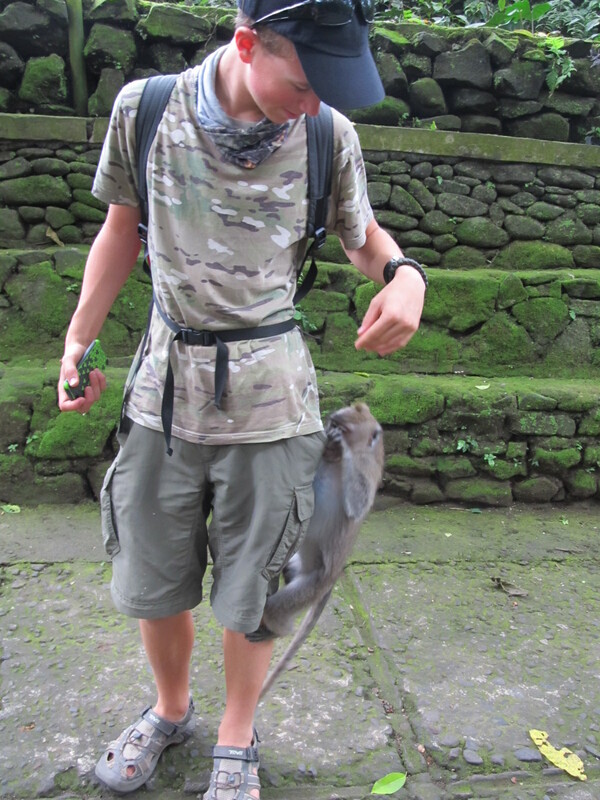 A big highlight was the Monkey Sanctuary, near Ubud. 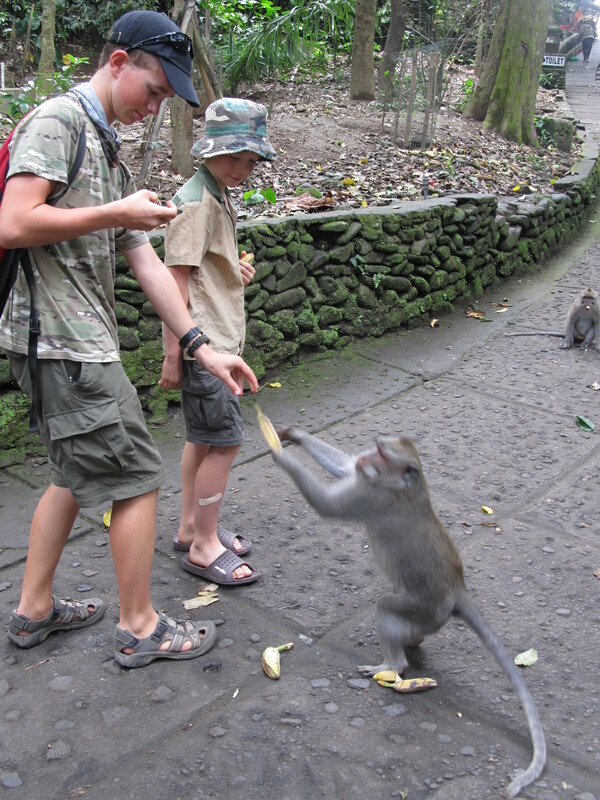 The boys had monkeys climbing up their legs looking for bananas which we fed them. A gorgeous forest remnant, complete with a couple of temples, the monkeys roamed around, stealing water bottles, landing on people’s heads, looking cute and innocent for photos before grabbing the bananas on offer and scooting up a tree. Very cool. 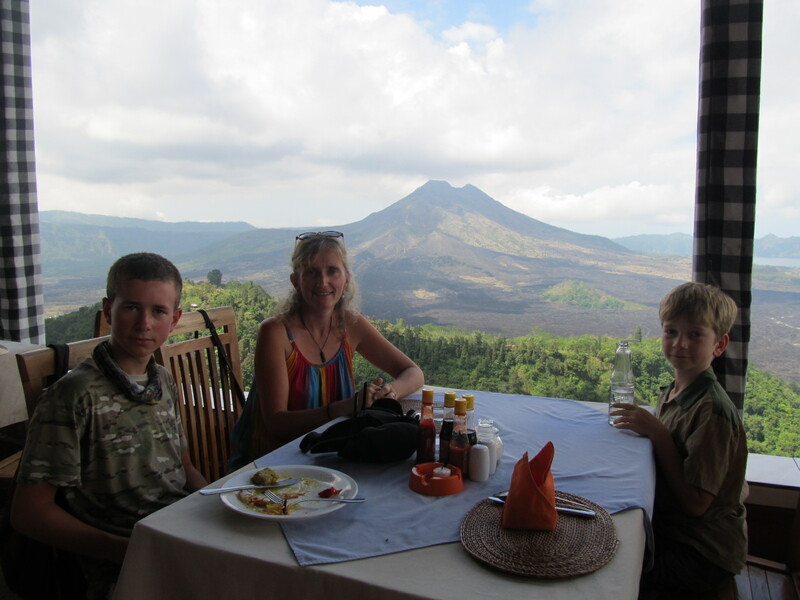 For lunch we sat with ringside seats for viewing Kintamani, one of Bali’s volcanoes. Impressive lava flows from the last eruption, only 50 years ago…. We visited a coffee plantation. 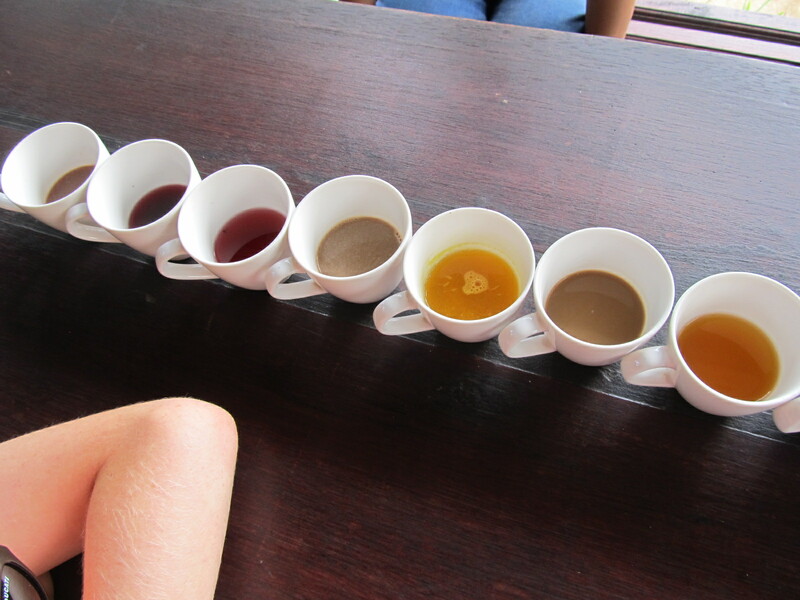 We really needed the absent coffee-drinkng members of our family, but after a tour of some cacao, nutmeg, coffee and other tropical trees we were treated to a range of different teas and coffees. 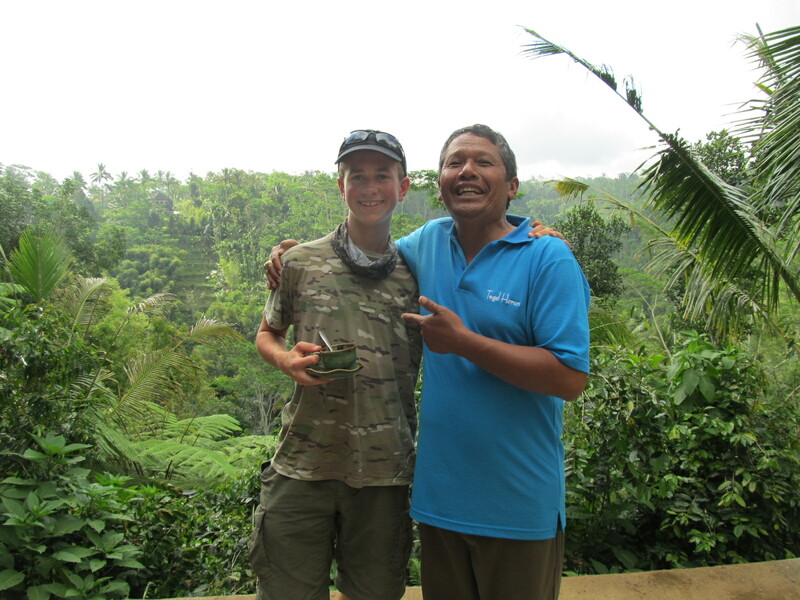 Ollie stepped up to the tourist mark and he sampled the ‘most expensive coffee in the world’ – Luwak. This is made from cat poo…..literally! The little wildcat ,the Civet, eats the coffee beans and a couple of days later they pass through him, still whole and are collected and dried. 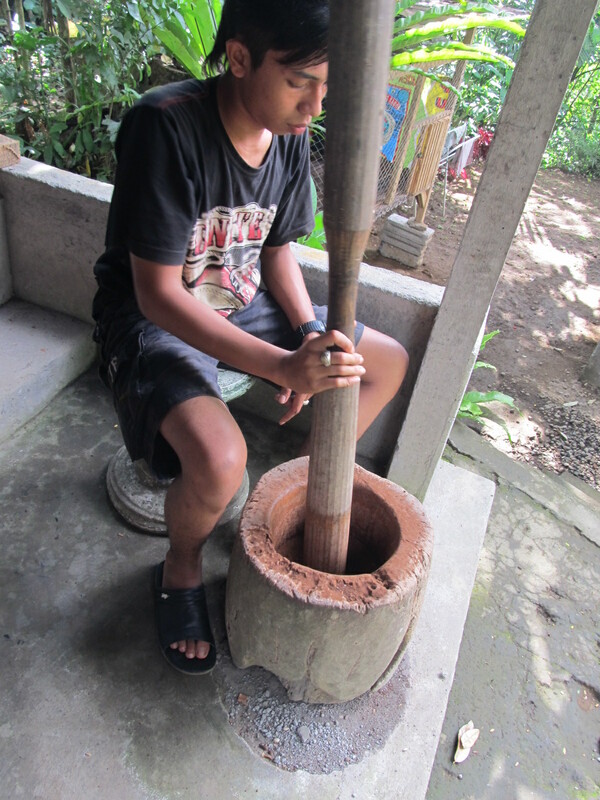 At this plantation they roasted their own beans in a wok over an open fire, and grind them in a large mortar. 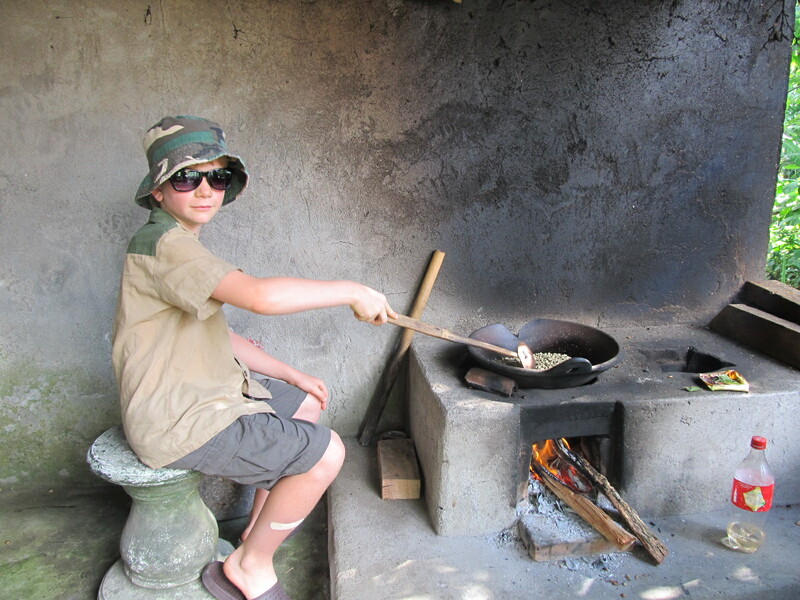 Charlie having a go at roasting coffee beans. 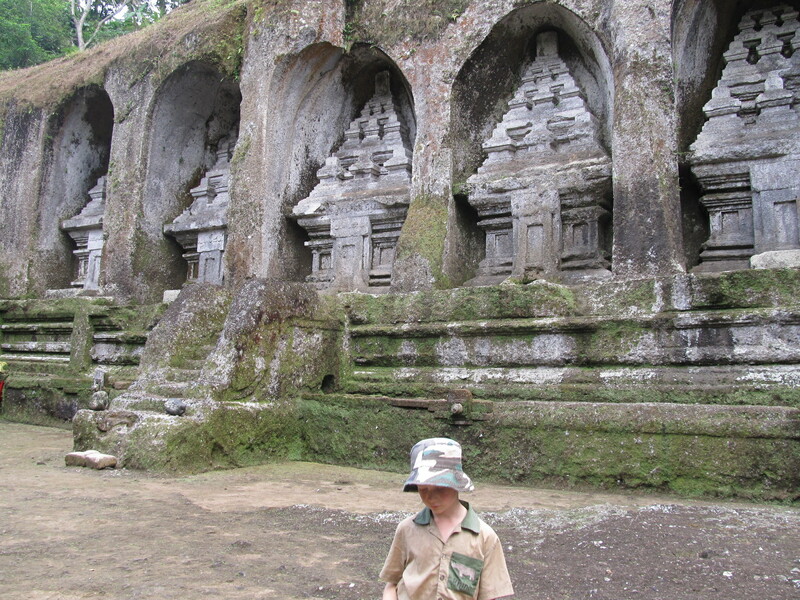 Gunung Kawi is a huge old temple in the jungle, down many steps. Large rock carvings are very innvocative of Indiana Jones. 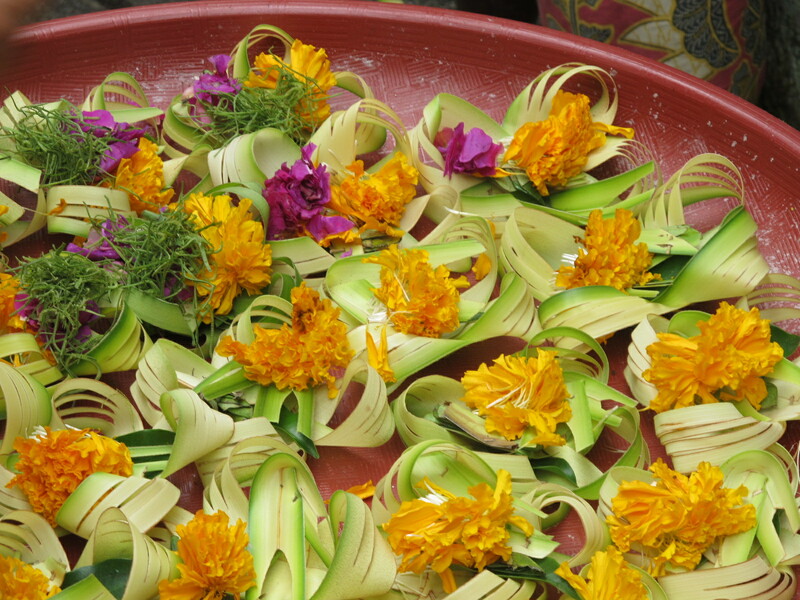 Women go to the temple in the afternoons to make offerings, and here they were incredible. We crossed the river, enjoyed the peace of the jungle and the serenity of the rice paddies everywhere. Rice is harvested three times a year, a huge amount of back breaking work. As we drove home through the gathering dusk there were two women sitting next to their families rice fields with a mini altar of offerings. They were praying for a good harvest, a good price and an easy time. I think that is Bali for us. A good price and an easy time…. It is an island that has offered us 1000 blessings which we have gratefully recieved. 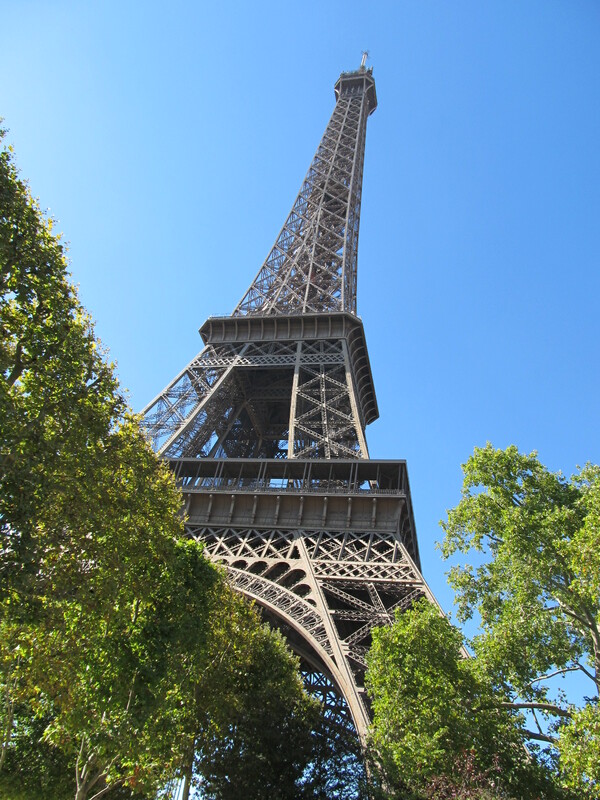 Trois: Oui, the Eiffel tower and yes we went to the top….bein sur! 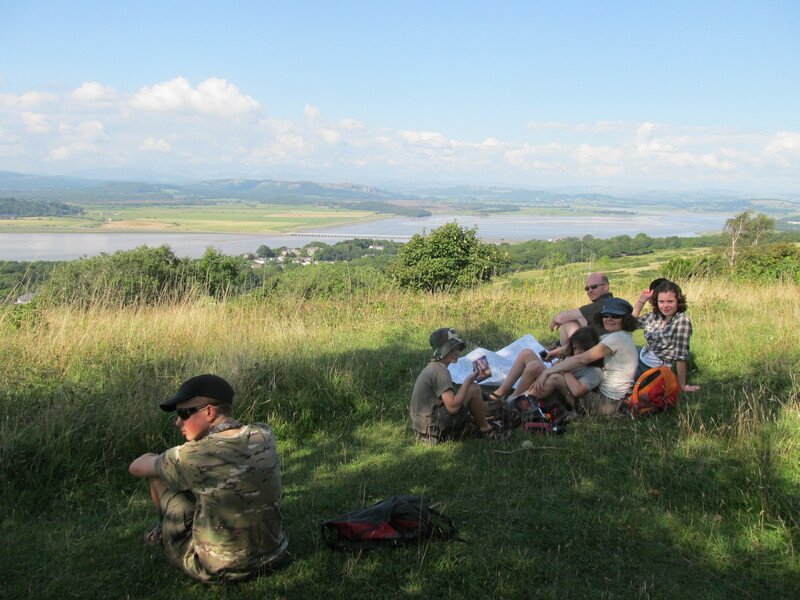 And from the top…..the wonderful weather we have enjoyed everywhere continued. 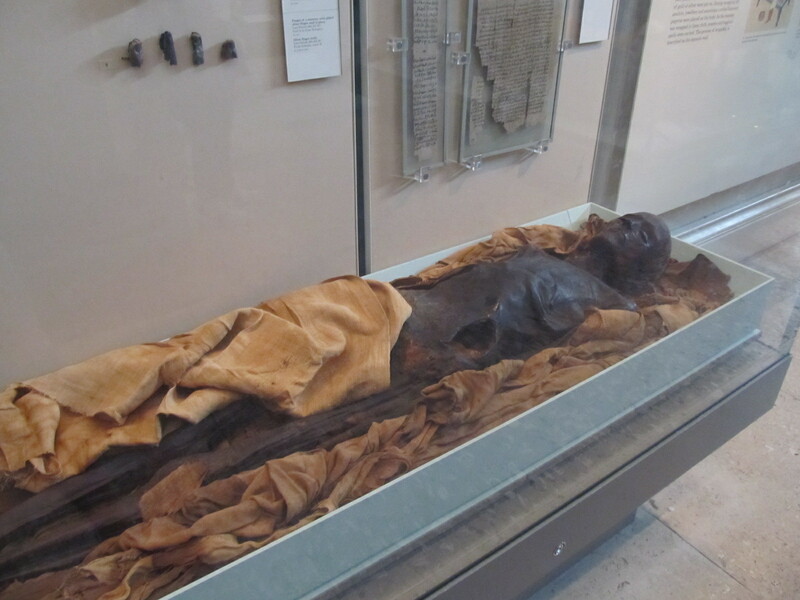 Cinq: La Louvre! 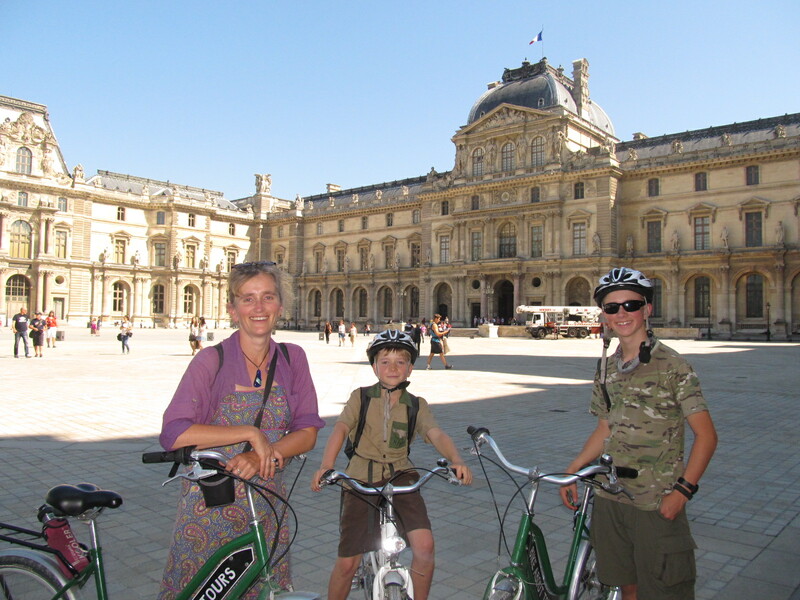 Oh boy it was magnificent…and we only cycled around the outside! 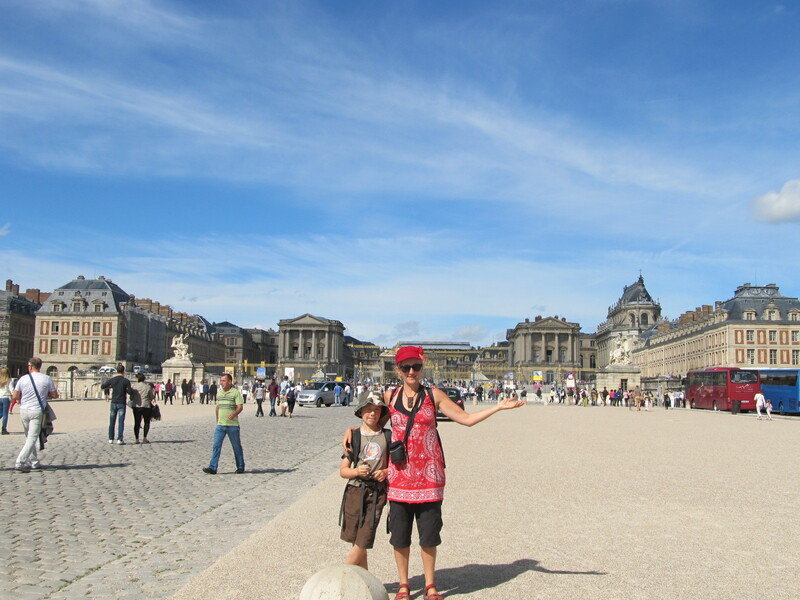 The top 5 and then you add on other biggies…..Pompidou Centre, all the musee -Orsay, Rodin, les Jardin….. The best thing we have done here is another cycle tour. A few years I read an article about this Kiwi guy who had a company in Paris and had filed it away especially for this trip. 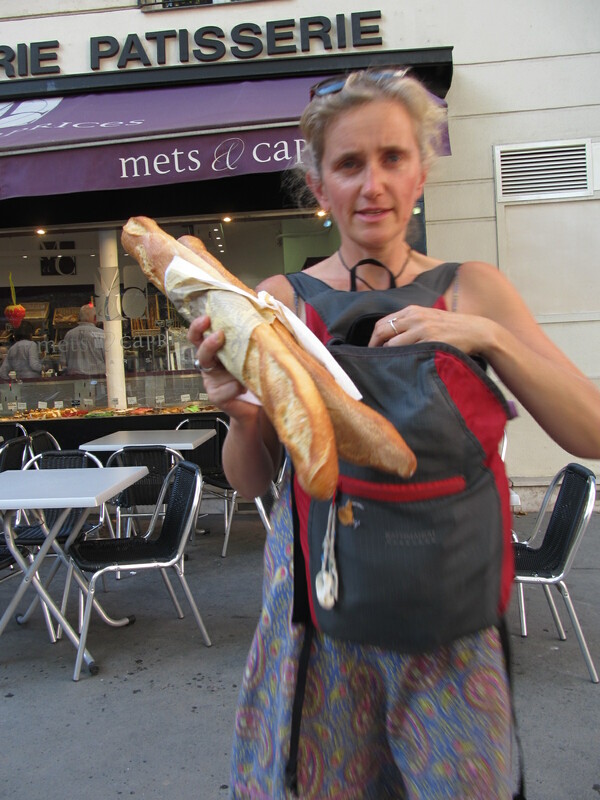 For me there are many great things about a cycle tour. A chance to hang out with other English speaking adults and have a laugh (we had two other Kiwis and 2 Americans who were into homechooling, with us), this is really important for me. Then there is the fact I can just sit back and follow, no decisions to make, no guide book to read, Marcel our guide just told us the stories and led us to fabulous places, nothing I had to do but enjoy it. Hearing a potted version of the French revolution on a bridge over the Seine while gazing at where the Bastille had been was priceless! Riding around a city is such a superb way to see it. 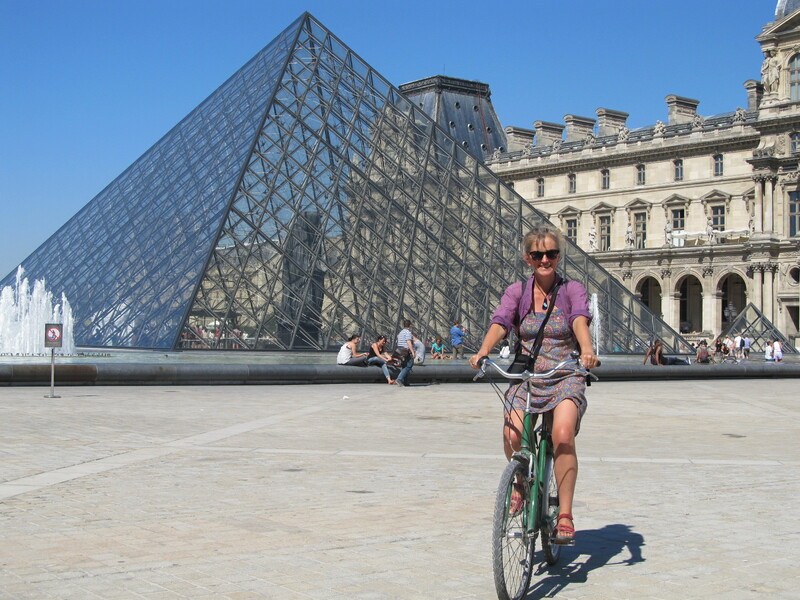 Grand avenues, tiny alleyways, cobbled streets, private gardens, mini villages, Seine-side, food filled streets, bridges parks and the best ever – riding around The Louvre! Yeeha!! 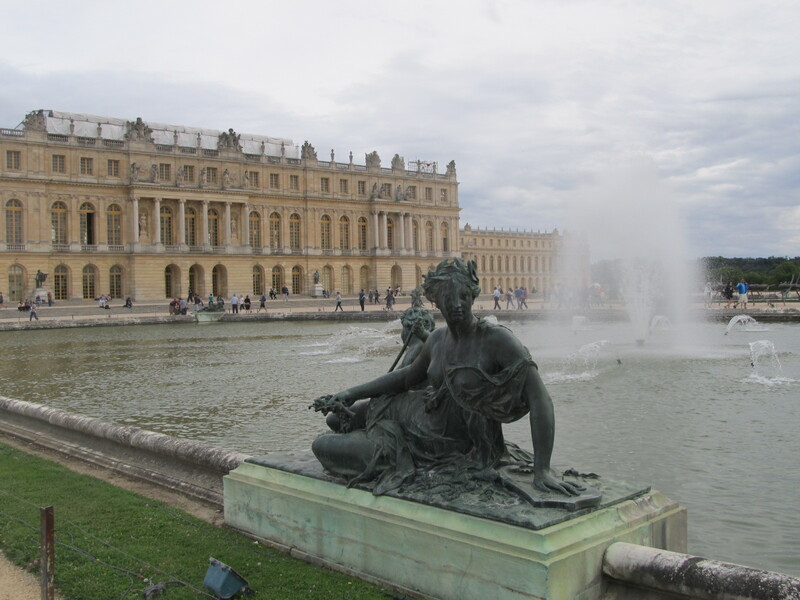 Such a huge and grandiose Palace. That was ‘formidable!’ (En Francais). 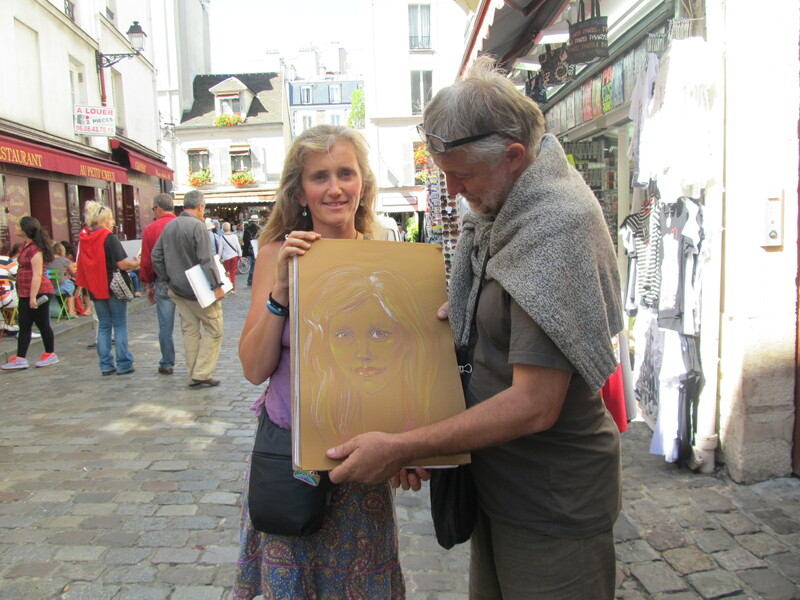 We visited Victor Hugo’s house…. 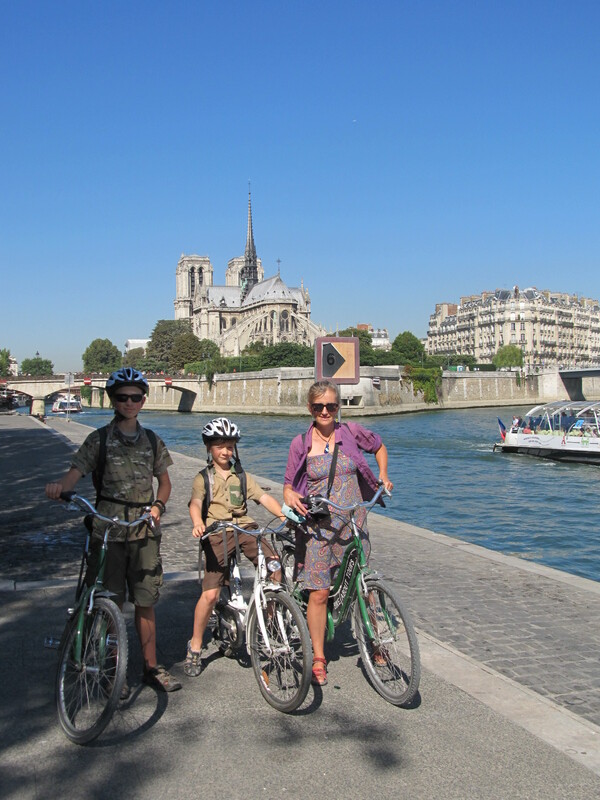 Even though we negotiated some major roads at times, riding along the Seine was fantastic! 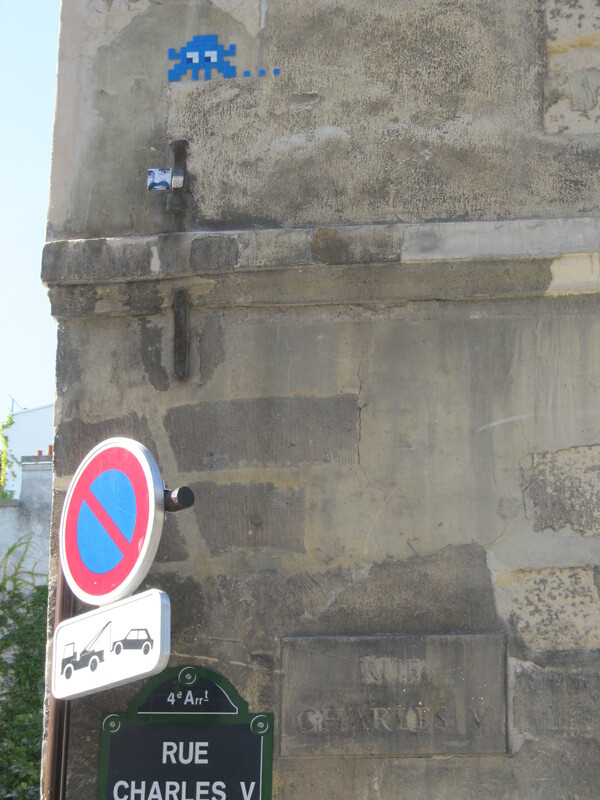 Tracking down the latest Parisian graffitti artist who leaves a “pacman”…. 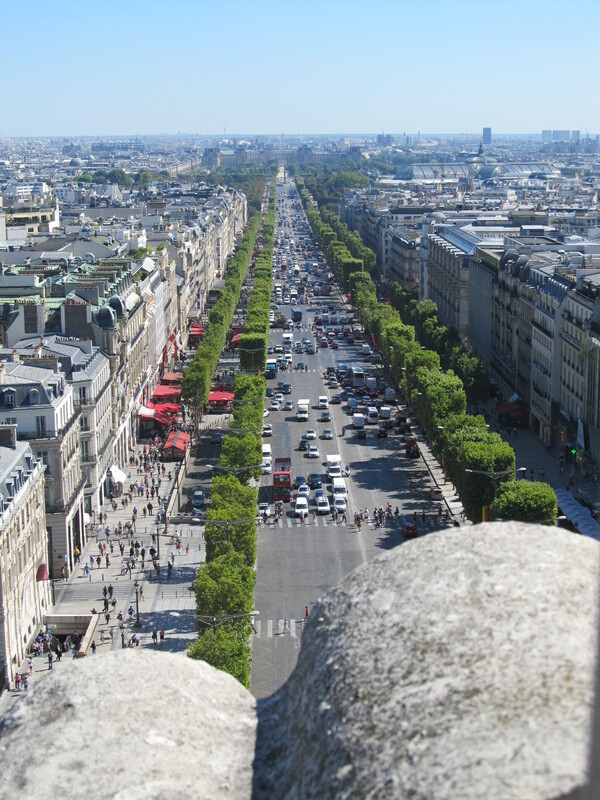 There are two bridges where couples buy a padlock, write their initials on it, lock it to the bridge and throw the key into the Seine. 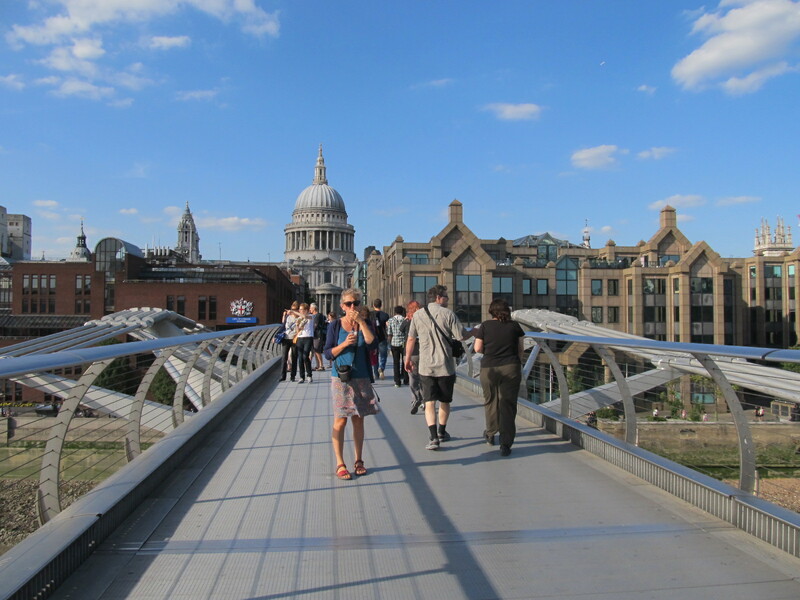 The bridges are totally loaded with padlocks of all shapes and sizes. There was a Japanese couple in their wedding clothes doing this, all very romantic until they threw the key and it landed on the roof of a passing boat!! Not sure what this means…. My 4th form French has flowed surprisingly well. The kids were suitably impressed with me the first time I conversed and was understood. The man at the local vege shop, where we have bought stuff for the third day in a row, greets us like old ‘amies’ and tonight congratulated me on my French! The absolutely very best way to learn the lingo, be here and buy things!! 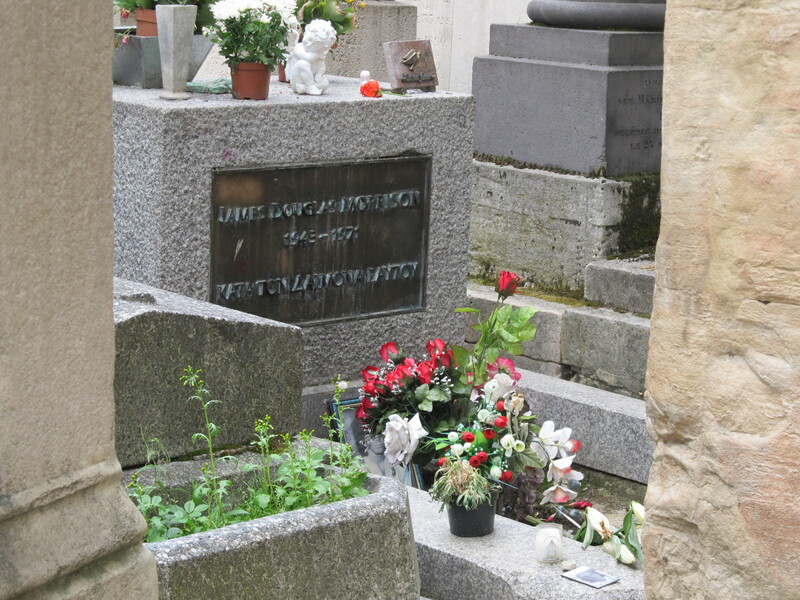 The most peaceful place was La Pere Lachaise cemetery, yes Jim Morrison is buried here, but also Chopin, Oscar Wilde, Edith Piaf, Liszt…..The place is huge with tombs that range from public phone box size to mini cottages, very tranquil although Ollie got the creeps after a while…. The leaves made it feel almost Autumnal…. 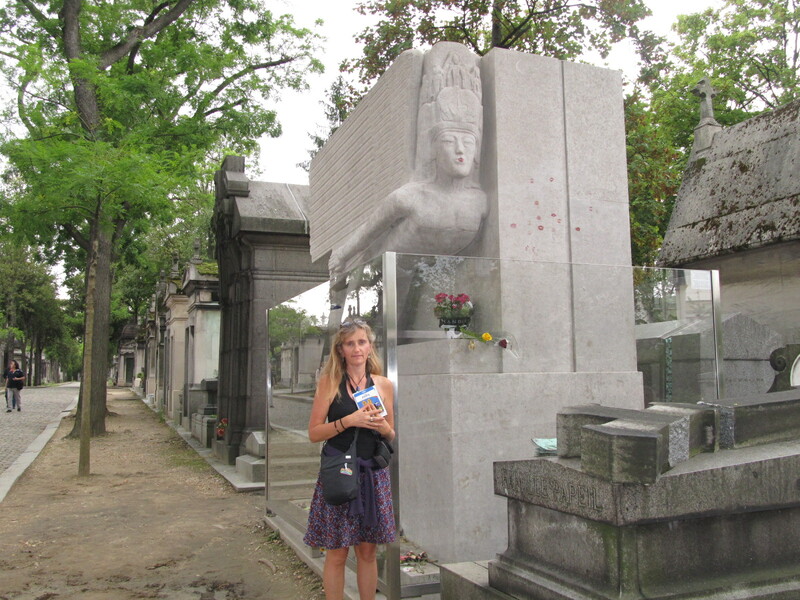 Jim Morrison’s underwhelming grave….and Oscar Wilde’s flamboyant nouveau angel-topped one! Ollie is happy as we have seen all the scams. There are warning signs aplenty about pickpockets. There are pamphlets about all the scams you will encounter. 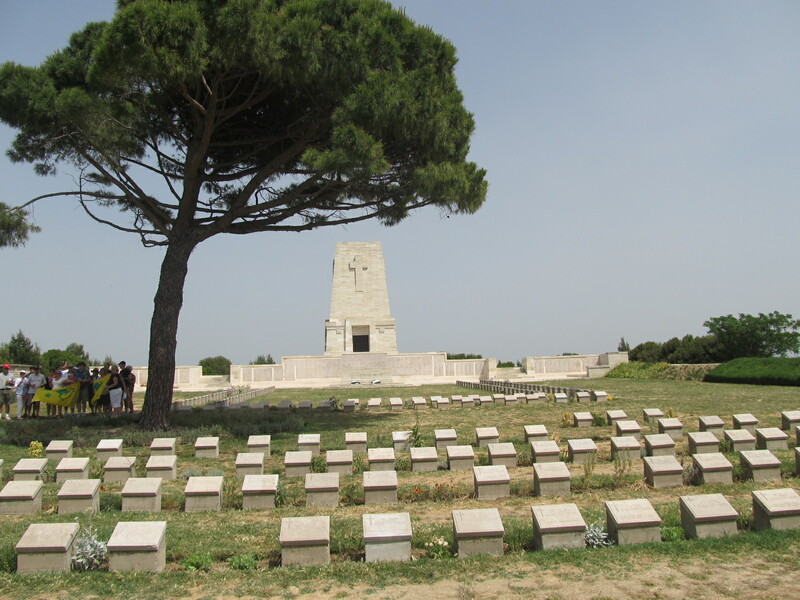 We had heard a lot about these from other travellers, which naturally fascinated the boys more than just ‘another old church’….. So very exciting, that they are just everywhere….The fake petition, the ring, the 3 cup swindle. Oui! Charlie’s Paris trip has been interesting. 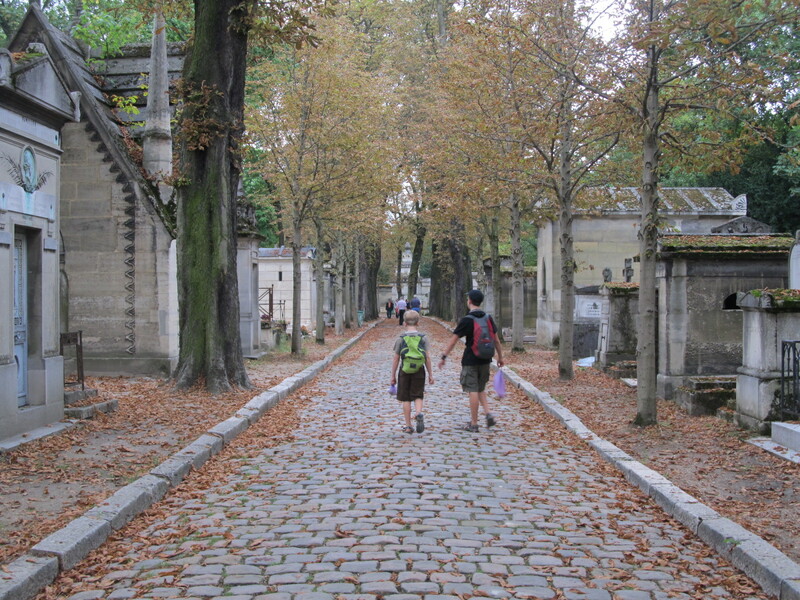 He had reached his expiry with regards to old buildings, churches and his very worse “ just wandering around the place.” So as a soundtrack to Paris and our sightseeing he has been plugged into “Harry Potter” (all 7 books!) being read by Steve Fry. Good old mp3! 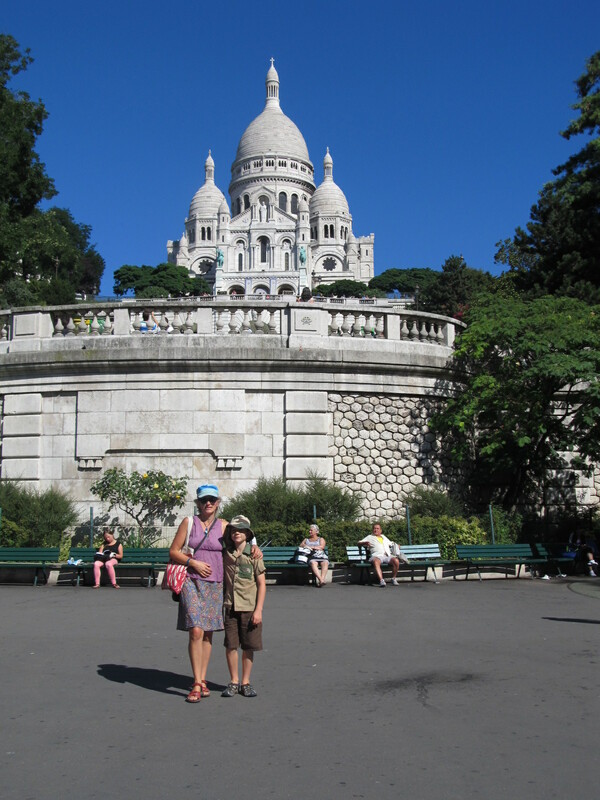 I am wondering how he will remember Paris though. Will the Eiffel Tower be forever linked with Cedric’s death? 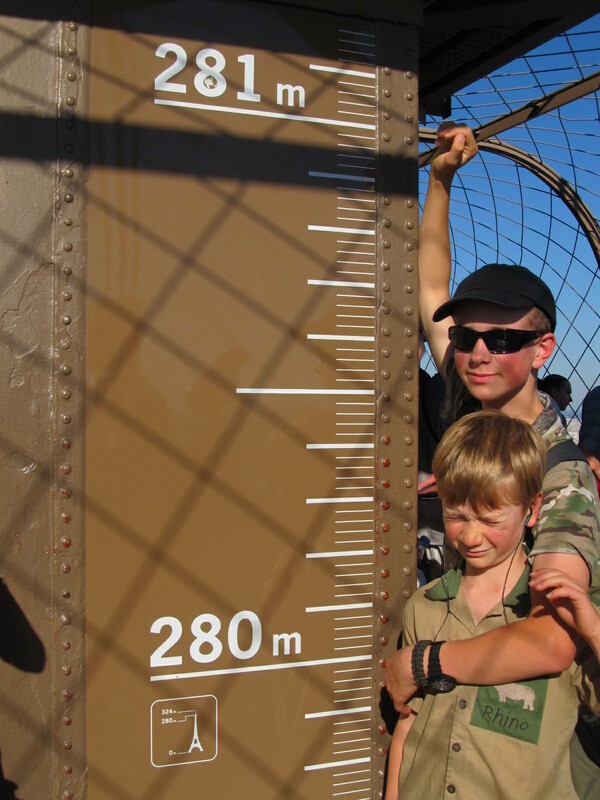 Will he only remember Voldemort’s return when he sees a photo of us up the Arc d’Triumph? Mmmmm…. The Metro is so efficient and quick. We have been buzzing around. 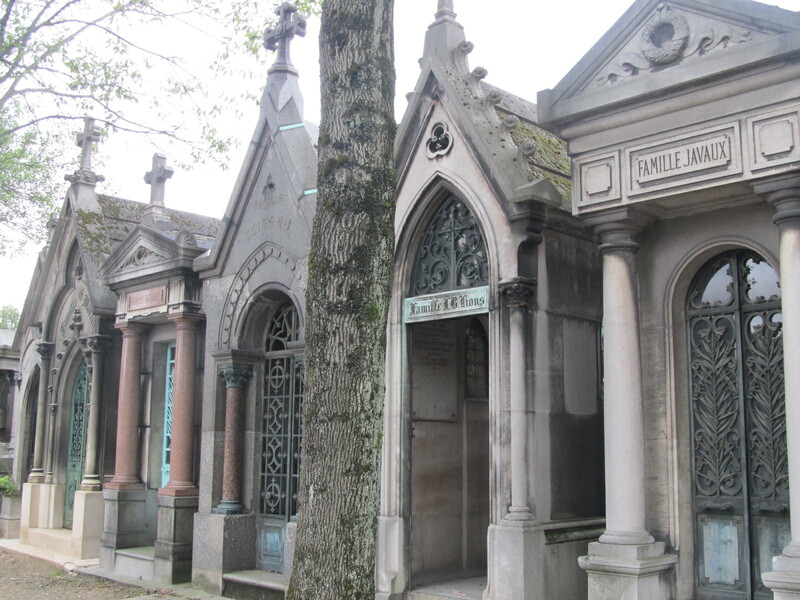 Parisians do seem exceptionally well dressed, stylish . So many women wearing ‘real’ shoes, high heels. Perhaps this is just in contrast to us in our well scuffed Teva sandals and after 4 months of wearing the same stuff. 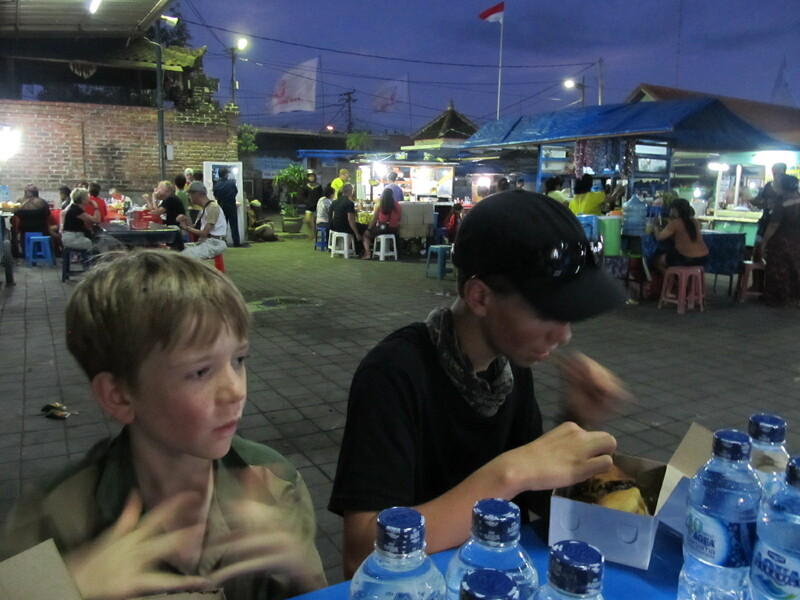 Charlie’s 2nd pair of sandals is dying….just got to get to Bali…. 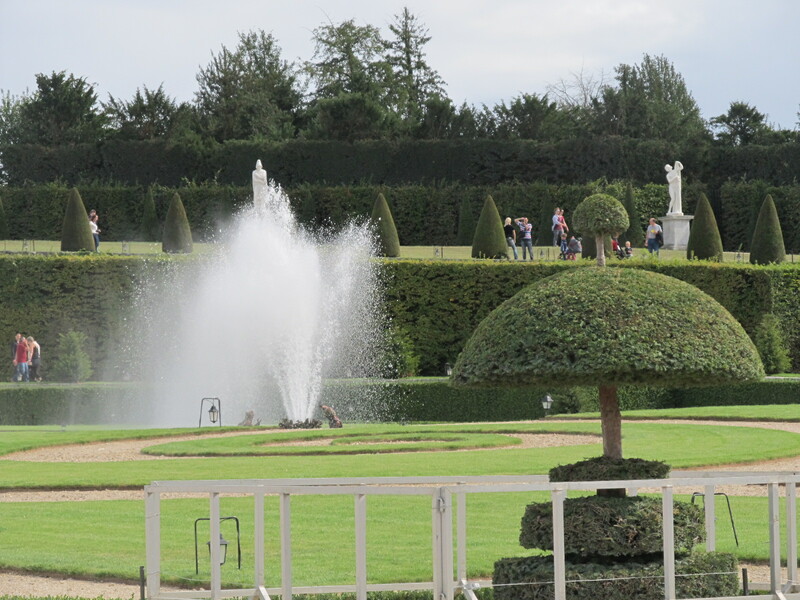 Versaille was high on my list and I am so glad we spent a day out there. Such a huge palace. 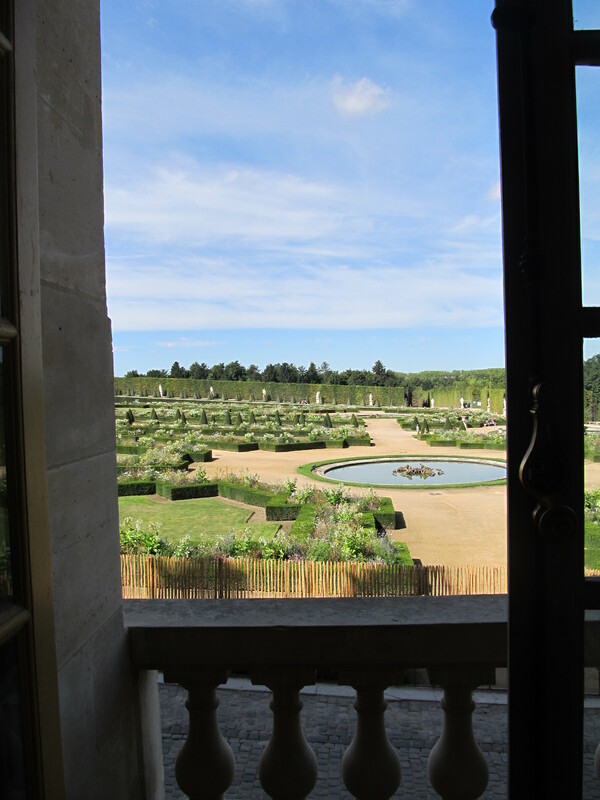 Such grand gardens. Tres magnifique! 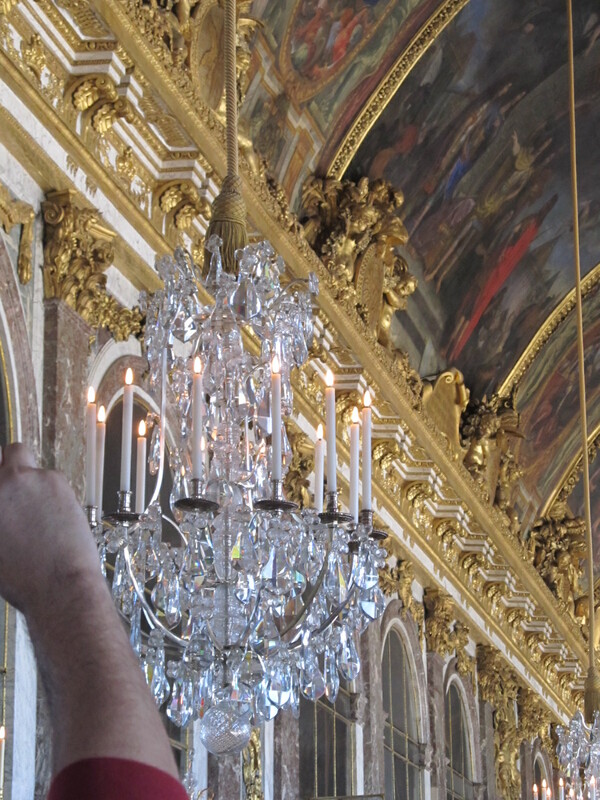 MInd blowingly huge and opulent…. 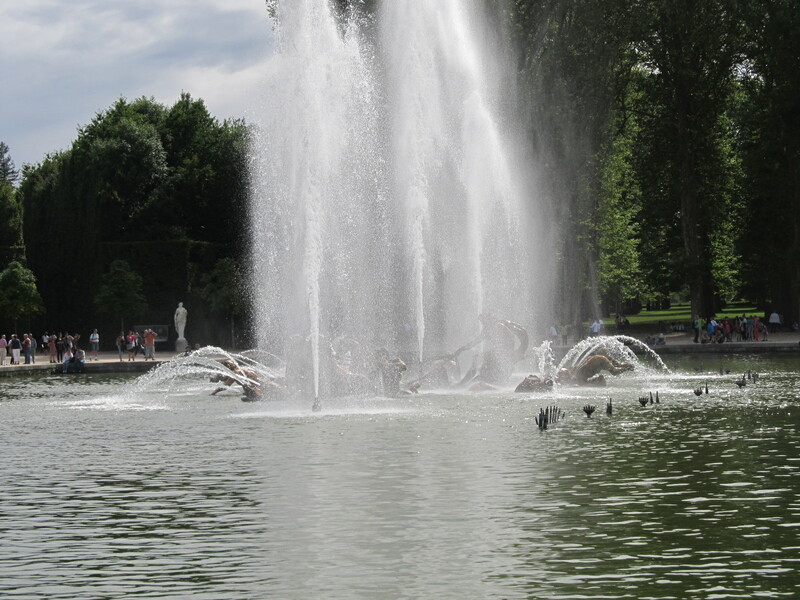 We stayed for the fountain shows, dozens of different fountains, all very unique in it’s own garden, each one designed beautifully. Good to see and hear about some history on the other side of the channel, Marie Antionette et al. 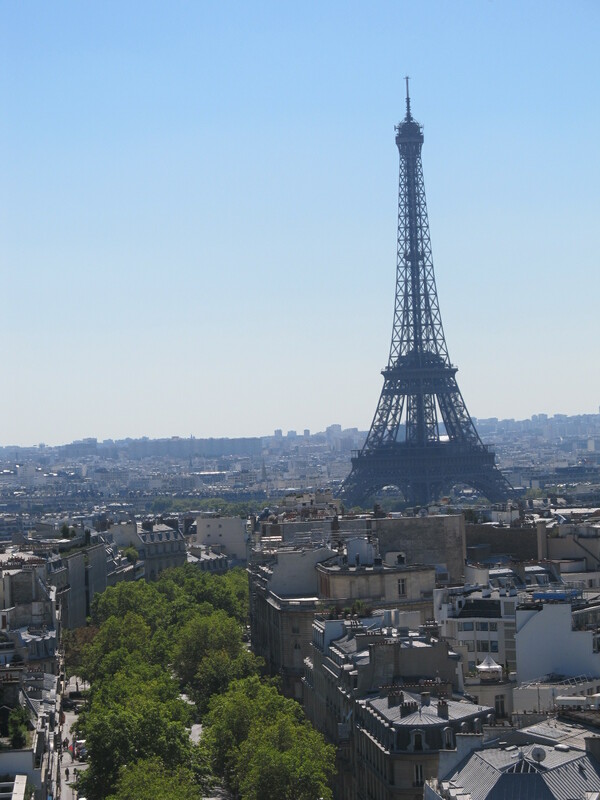 So Paris was bonne indeed. We spent 4 extra hours at the airport, as our flight was delayed, but we passed that playing with 2 youngsters whose mums were both French but had married Australians and lived there now. Both had been ‘home’ for the summer and now were flying solo back with their babies. Ollie had a ball with the 2yr old , well a balloon mostly…. 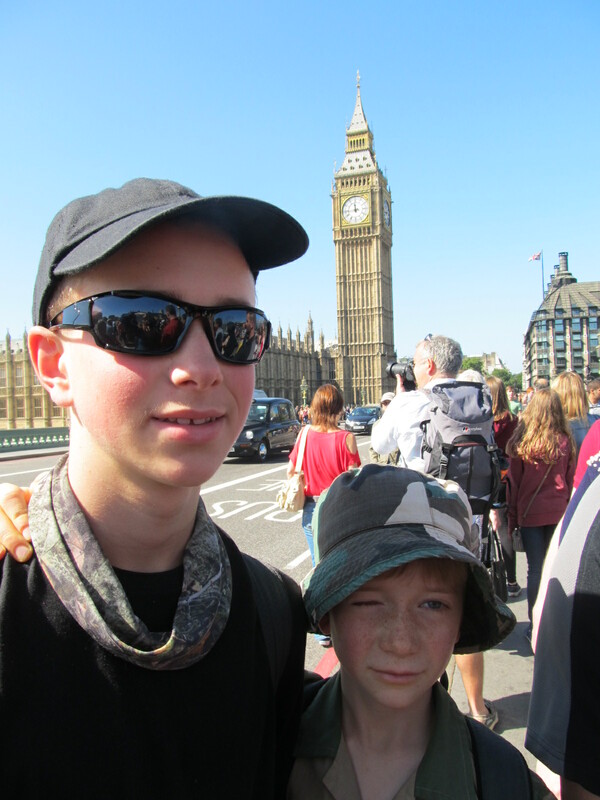 While in London for our last few days we are saying our goodbyes. This involves a mixture of things. 2. 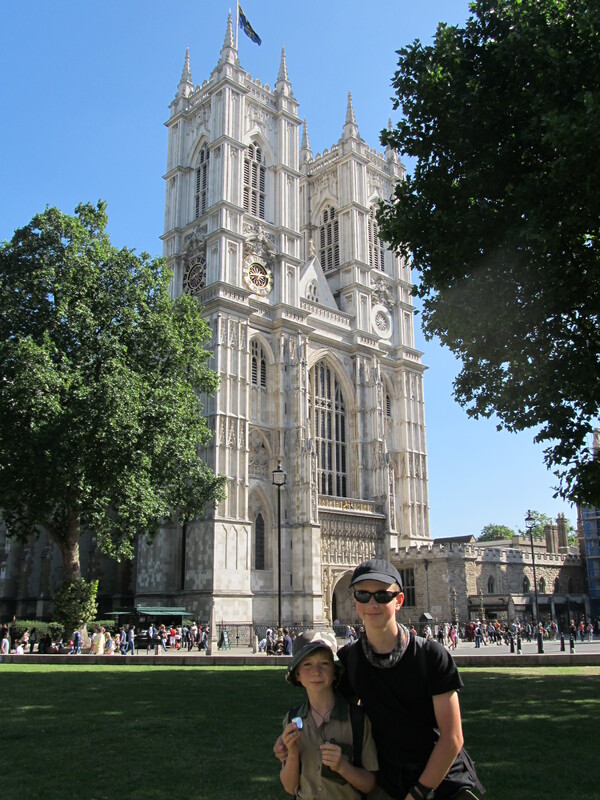 Doing things on our list that we hadn’t done yet – the Science Museum, National Portrait Gallery, Millenium bridge, the Churchill Museum and Cabinet War Rooms – they were fascinating. 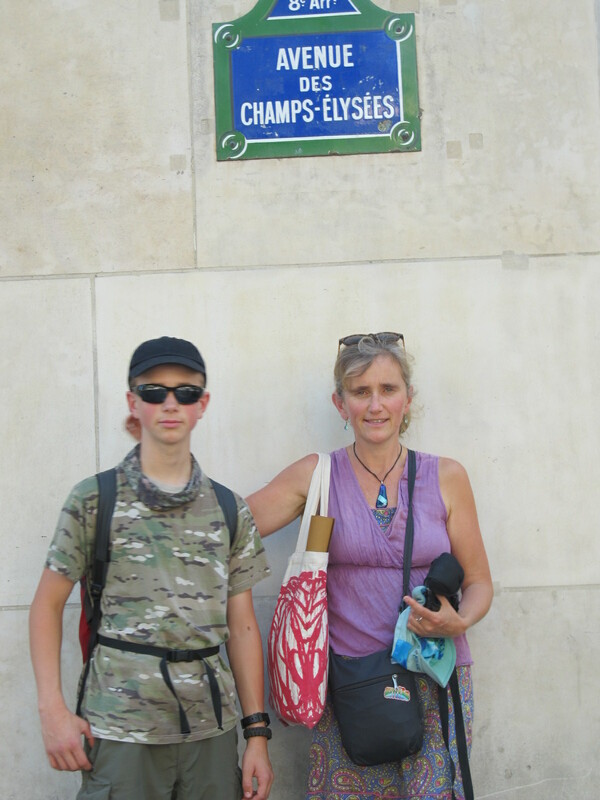 My map in is tatters now so it must be time to find my crisp new Paris one…. 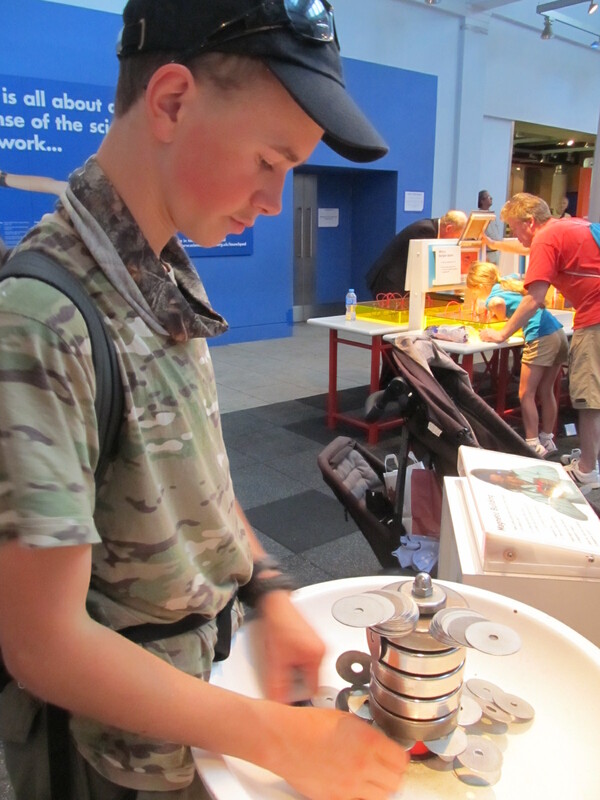 Charlie spent 3 hours on one thing at the Science Museum -The Machine. 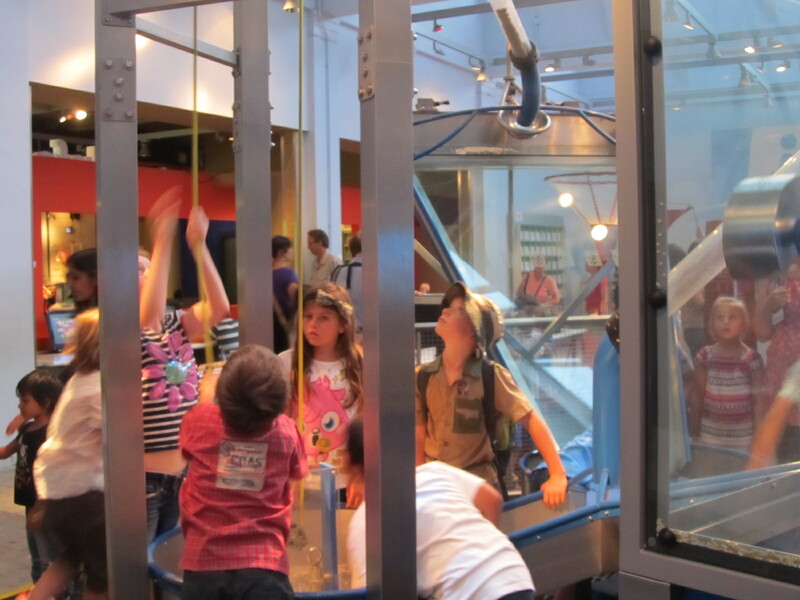 It was comprised of tubes, pulleys, wheels, funnels and milions of tiny plastic baubles simulating sand. Such committment and focus. He was very happy and worked tirelessly with other boys as they came and went employing different stategies but always teamwork, communication, passion and so much pure physics! Anyone who has visited this “unschoolers paradise” ( as Ollie called it) will know how much there is to see and do. Ollie and I got plenty of time (three hours to be exact) to play with all the other hands-on things in the same area…. 3. Actually saying goodbye face-to-face, ringing family, emailing, writing cards…..
4. Feeling the nights closing in, very quickly and a cooler touch in the air. 5. Posting a huge box home, full of souvenirs, clothes, books, gifts…..
Clicking and riding can cause a conundrum…..
Charlie earning some more dog money. 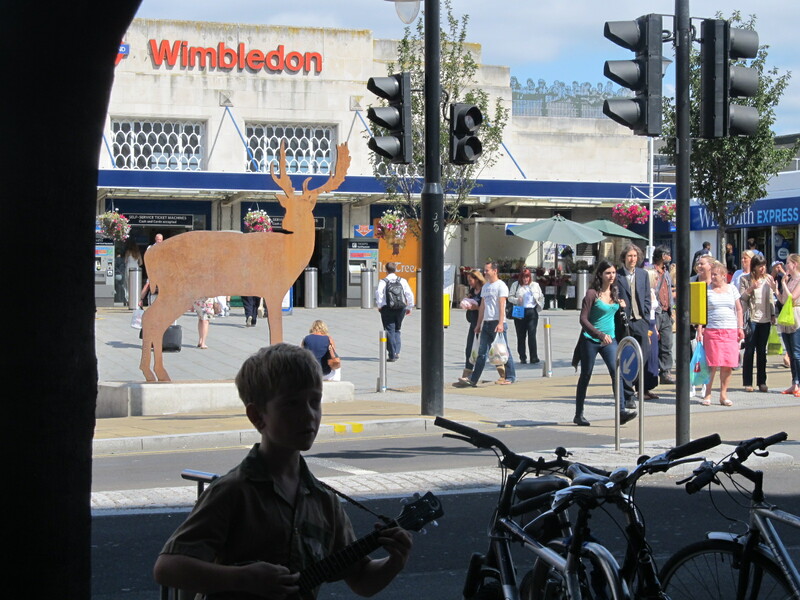 Another inspiring session on Wimbleon Broadway. Getting to be more of a grimace me thinks…. 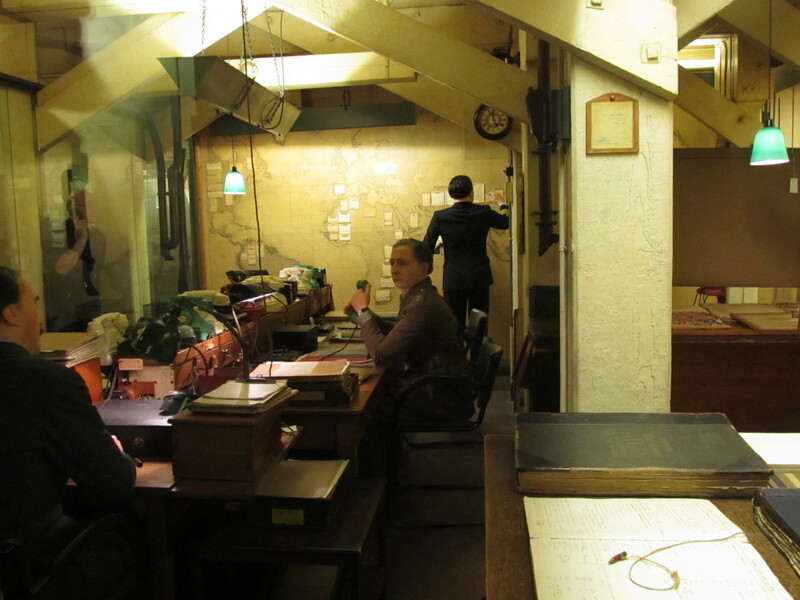 The War cabinet Rooms were left as is when staff literally walked out in 1945 and the doors were locked. It wasn’t until the 1970’s they were rediscovered untouched and now you can see quite realistically what life was like for those who worked there….running the war alongside Churchill. 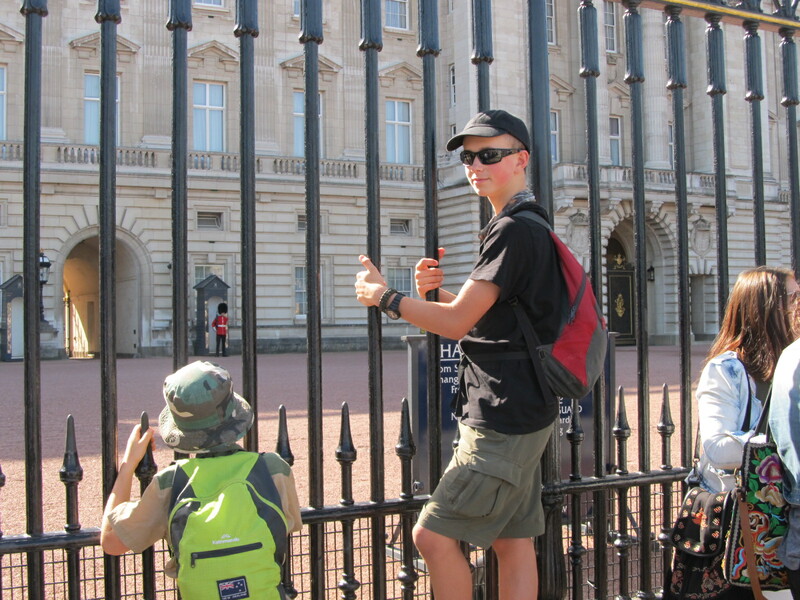 Our third visist to Buckingham Palace. 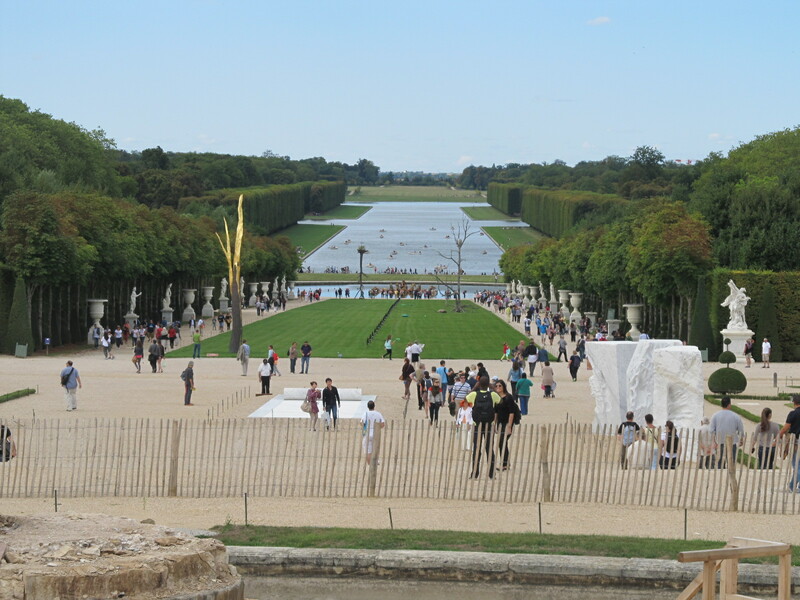 But first time without the huge crowds, ie just the normal hundreds…. 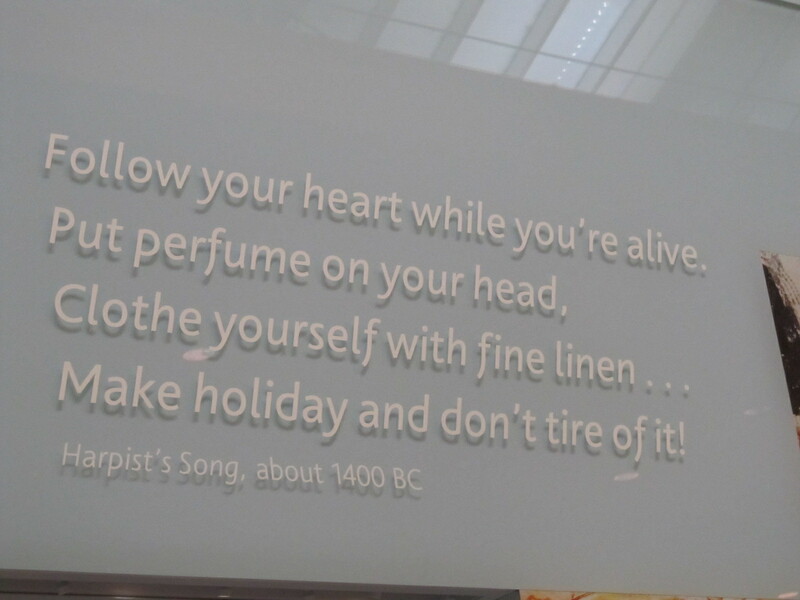 The British Museum mummies….a got-to-see and I loved this little quote, especially when I saw the date…..
And a little taster of home amidst all the history and granduer…. – Top notch and all that. 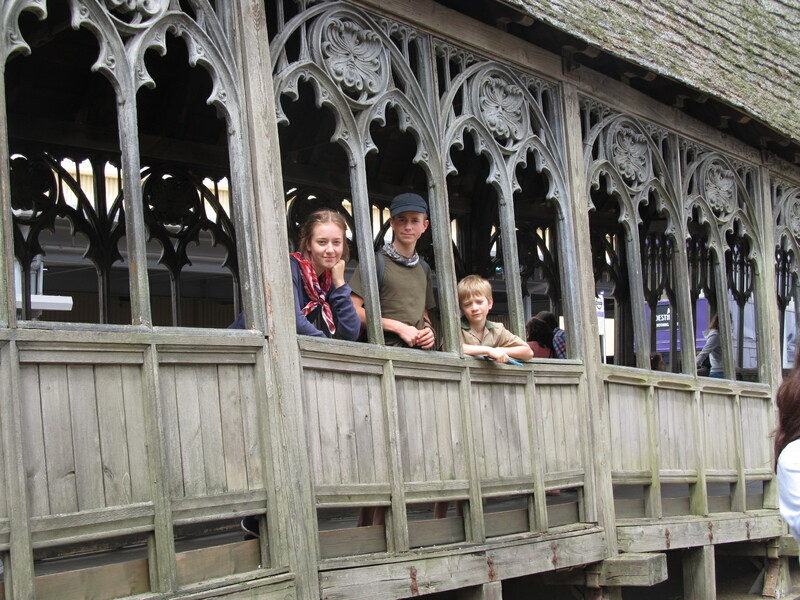 – Too-dal- pip old bean…..
How is the unschooling going? 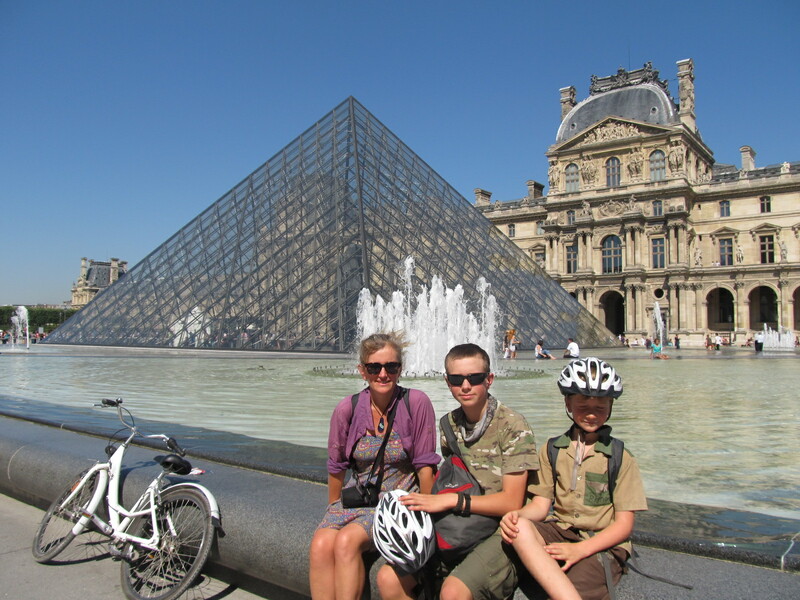 People do ask us if I am homeschooling the kids during our trip. 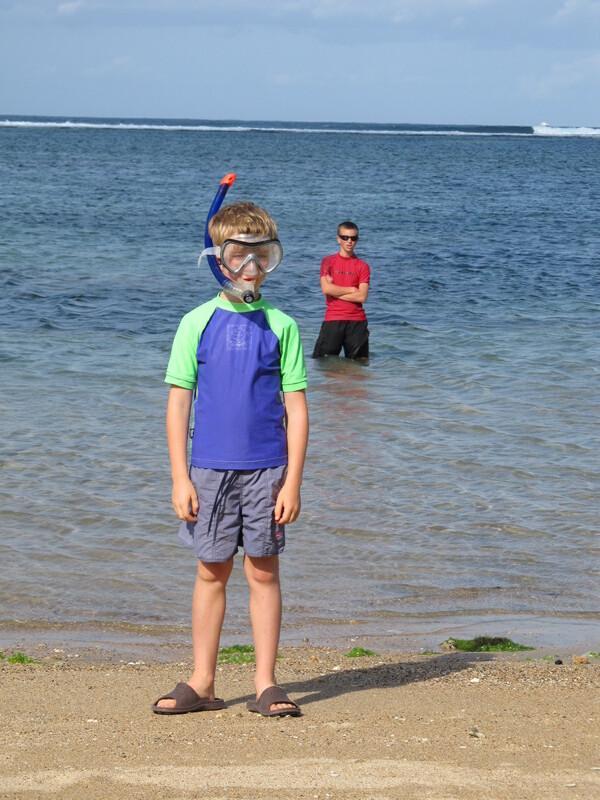 Of course the answer is no, I am not homeschooling the kids while we travel. However if they mean am I answering questions not-stop as I have for 12 years now, then yes. If they mean do I support them in their passions, then yes. If they mean am I helping them to be the best person they can, to be happy, to show compassion, understanding and patience, well then yes I am. Life is just same as ever really. 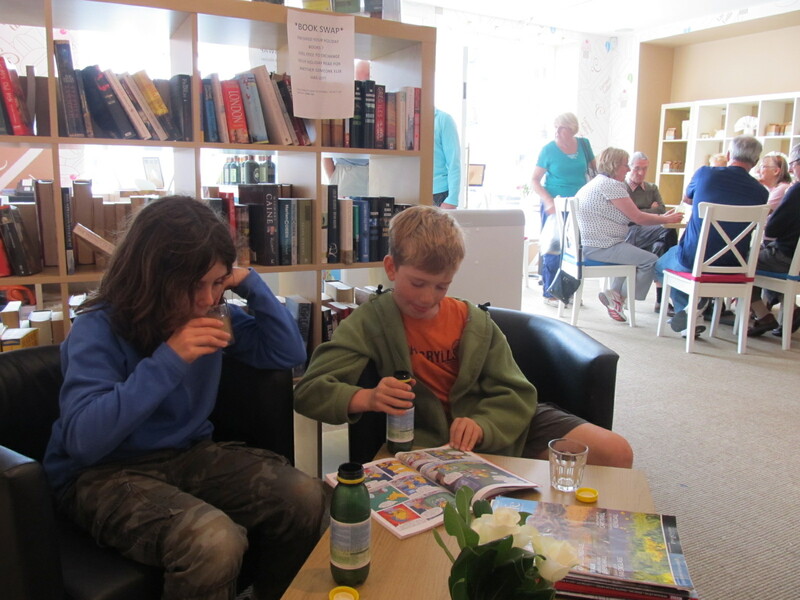 and an unusually high number of tourist shops and tea rooms…. Charlie has kept tabs on all the exchange rates we have and will still use. Over lunch today he converted between each for fun. There has been plenty of spending going on so it’s great to see the kids getting to spend other currency and work out the denominations. Reading timetables, bus routes, airplane departures lists, the underground map, converting time zones….all things I once wrote meaningless unit plans for as a teacher. All things the kids are doing in context with maximum motivation. Charlie has been watching Horrible Histories, The Pirates of the Carribean (savvy?) and listening to Steven Fry read Harry Potter on his mp3. Ollie follows news feeds and keeps us updated on the Syrian situation, any natural disasters as well as any debate or proposed change to gun laws in the States….. He has managed to read several Harry Potter books and many Chris Ryan (SAS) books while staying with people too. But as usual much of the kids learning is through conversation. We have had some humdinger discussions while driving. Usually this is Charlie and I. 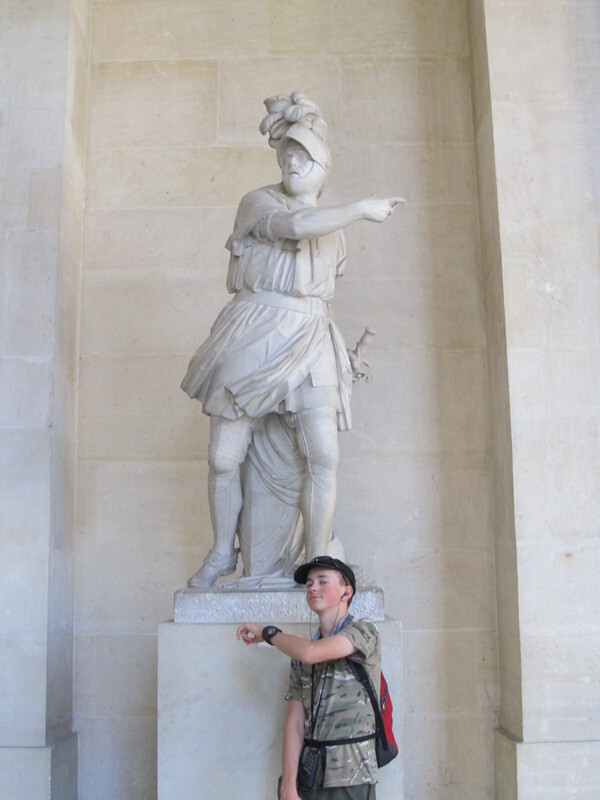 As navigator he is in the front and keeps up a commentary…..
– OK turn left onto the B6318….yes this one, here…..good …..
Then when we have been somewhere that has sparked questions for him directions are interspersed and added to the mix. These have caused several unplanned routes for us as I seem unable to concentrate on English roads while remembering random facts I studied 20 years ago! -But how did Henry the 8th just make up a whole new church? 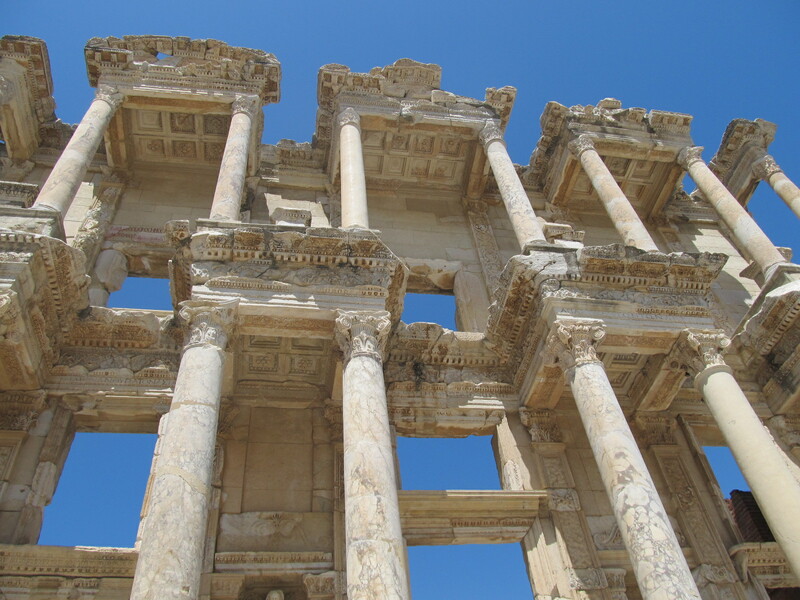 -Why did the locals not use the Roman baths after the Romans left? – Yes here, stay on the M5….left lane…..
– So was King Arthur actually real then? Grappling to understand the reasons why humans have gone to war, have burnt and tortured ‘witches’ and condemned each other for their differing beliefs has at times been belittled. Mainly this is due to more pressing things like navigating huge trucks and a myraid of road options off a massive round-a-bout. And so our worldschooling continues. Not only did we prolong our final goodbyes, but we saw and did heaps the next two days! The two boys stayed together and got to play. 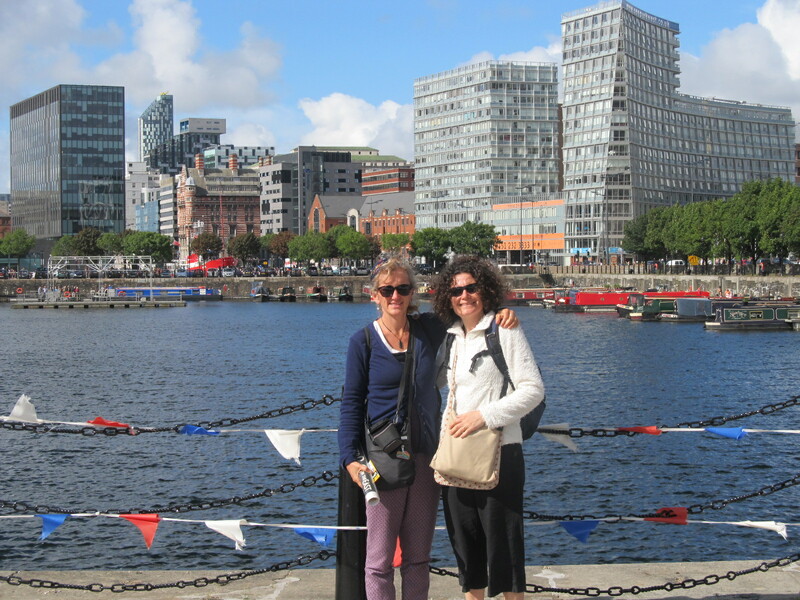 Karen and I with just the ‘big kids’ in tow met in Liverpool the next day for a big, fun-filled day out…. 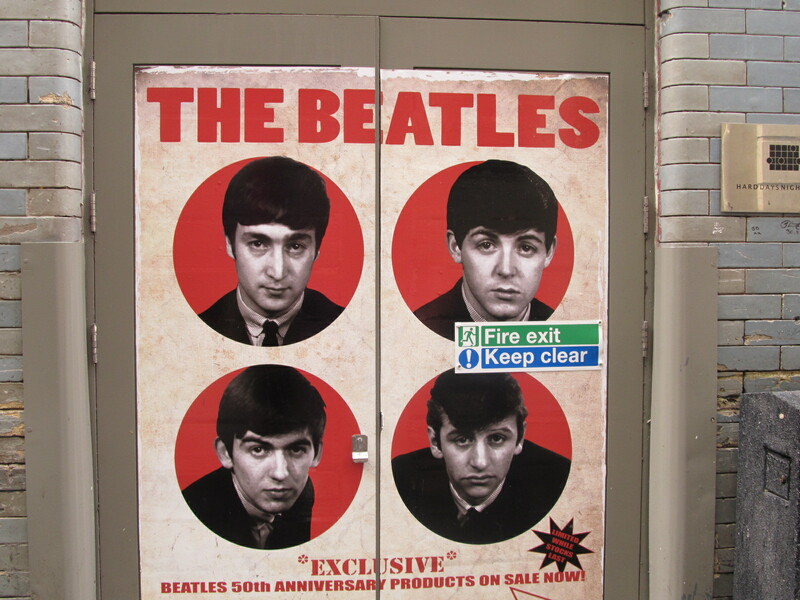 We soaked up the Beatles vibe…mostly in the Beatles shops where I bought postcards and stickers. 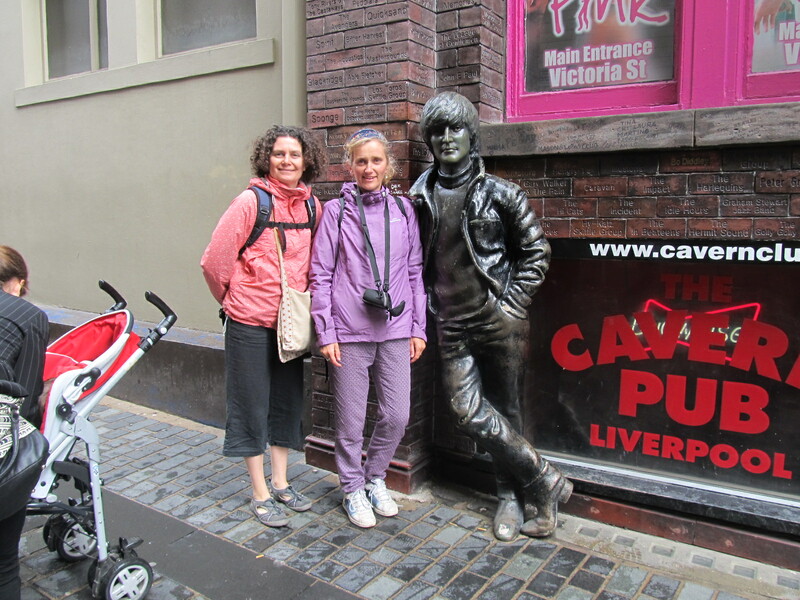 But it was very cool to see the Cavern and bump into Paul…. 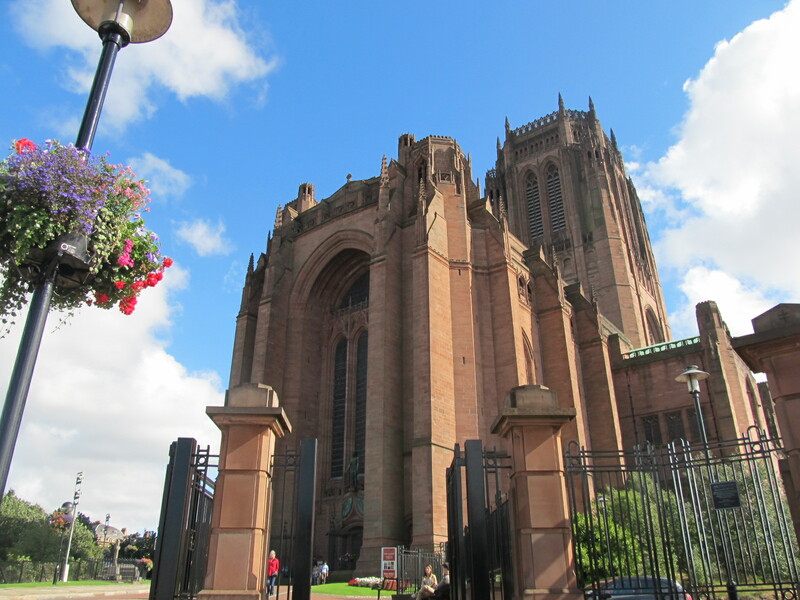 I was surprised at Liverpool, it is a beautiful city. 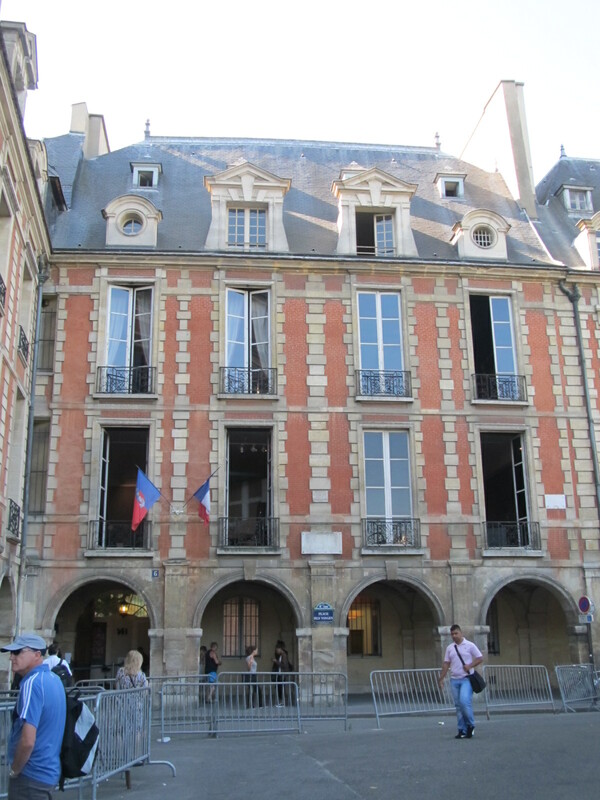 I loved the architecture, such a mixture of old and new. 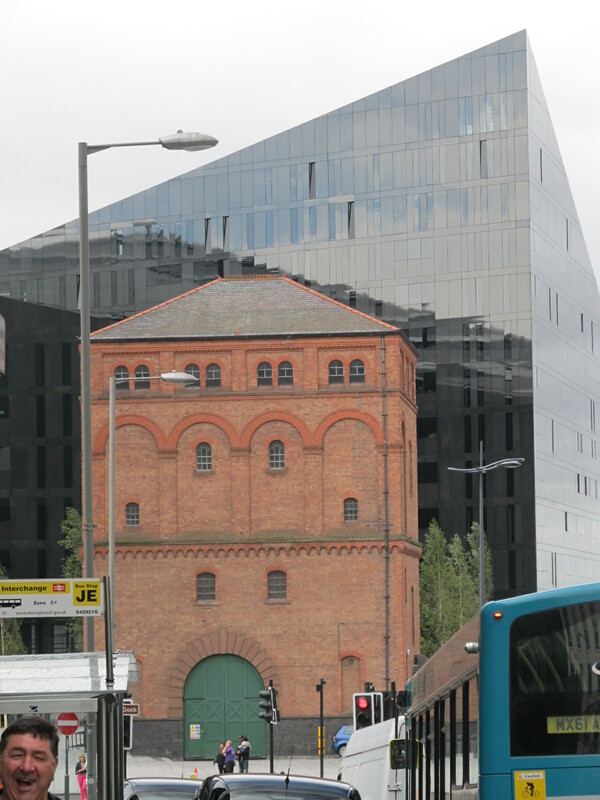 The docks are stunning with the huge brick buildings, now transformed into amazing museums. See? 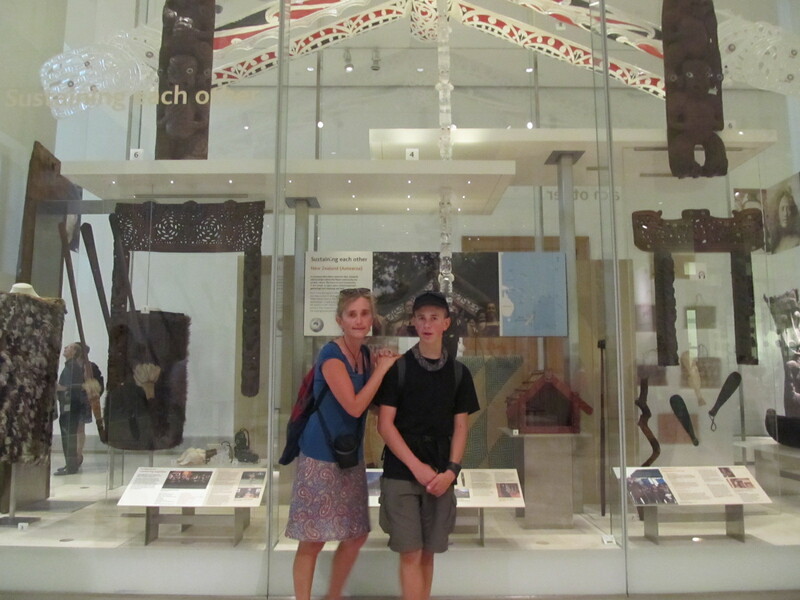 We spent time in the International Slavery Museum, which was excellent, though hard to stomach. There was also a very good Titanic exhibition, which was exciting as we have an enduing passion for the whole Titanic disaster in our family. 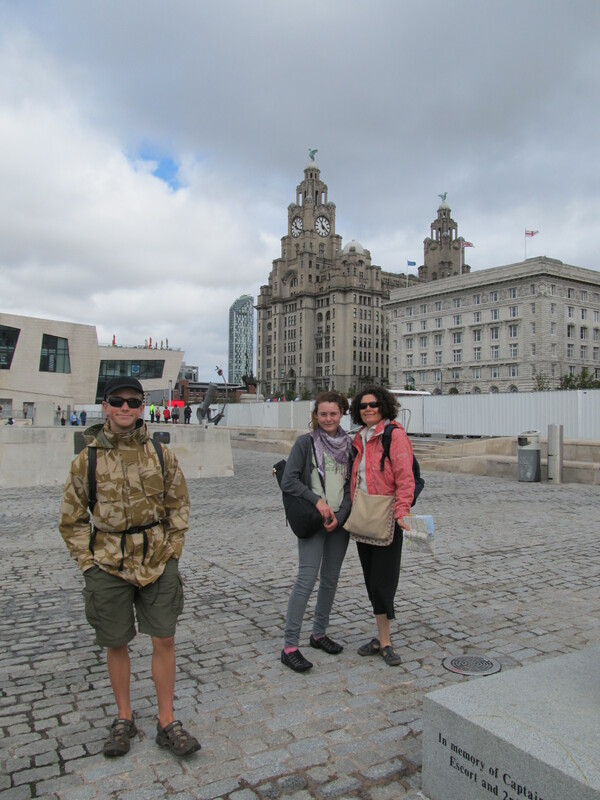 There seems much to celebrate and explore about Liverpool and it is done really well. 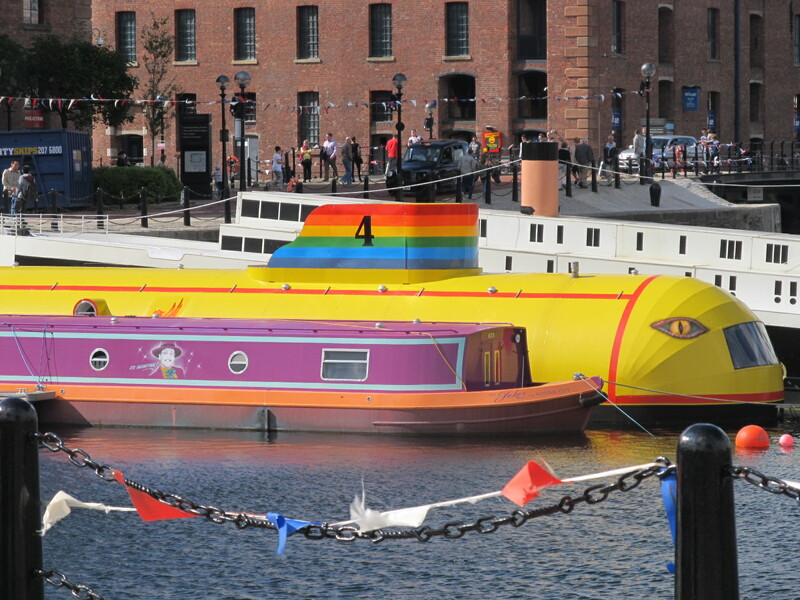 The shipping history and the Beatles rubbing shoulders easily. 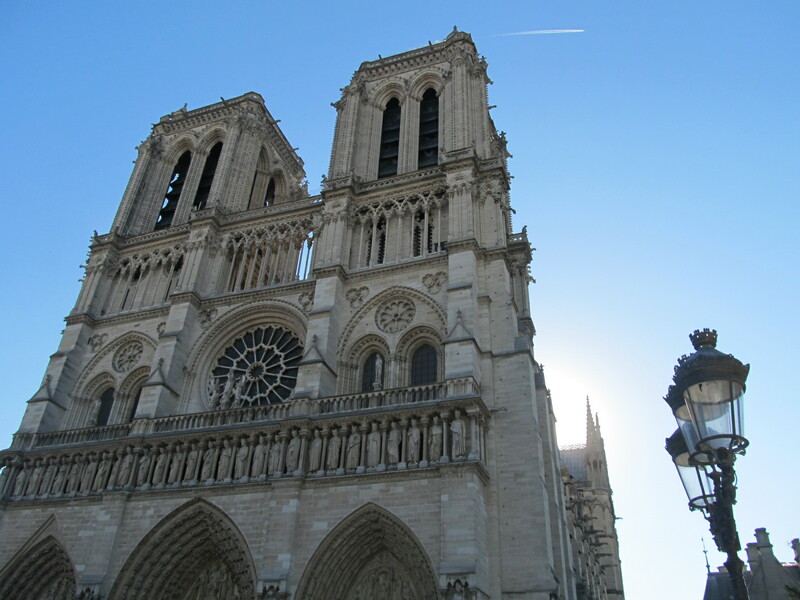 We even managed to fit in a visit to both stunning and completely different Cathedrals. 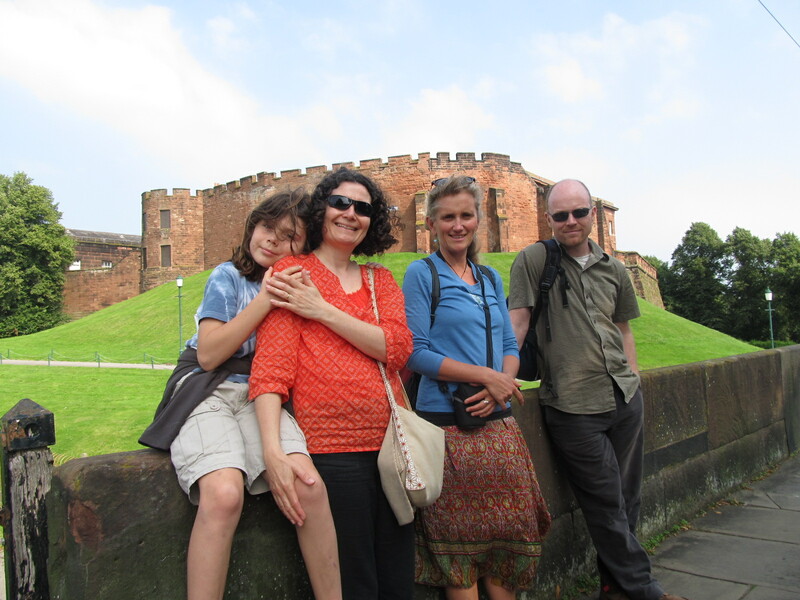 The next day we spent in beautiful Chester, where we were staying…. “Walk around the wall” we were told. So we did. 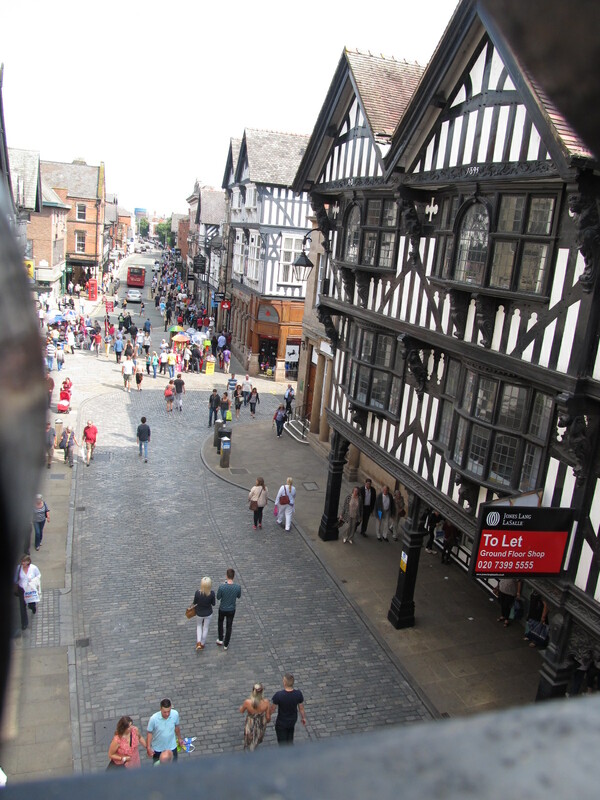 It was a beautiful day and Chester is just gorgeous. The wall walk is great. 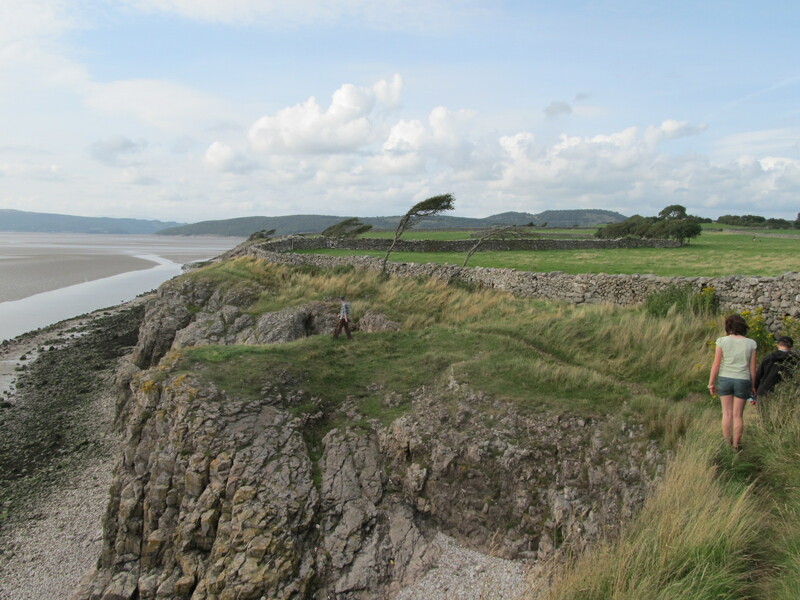 There are places to stop and get off, or view things, old watch towers to enter, guides dressed as Romans (or later periods) to inform you of historical events. 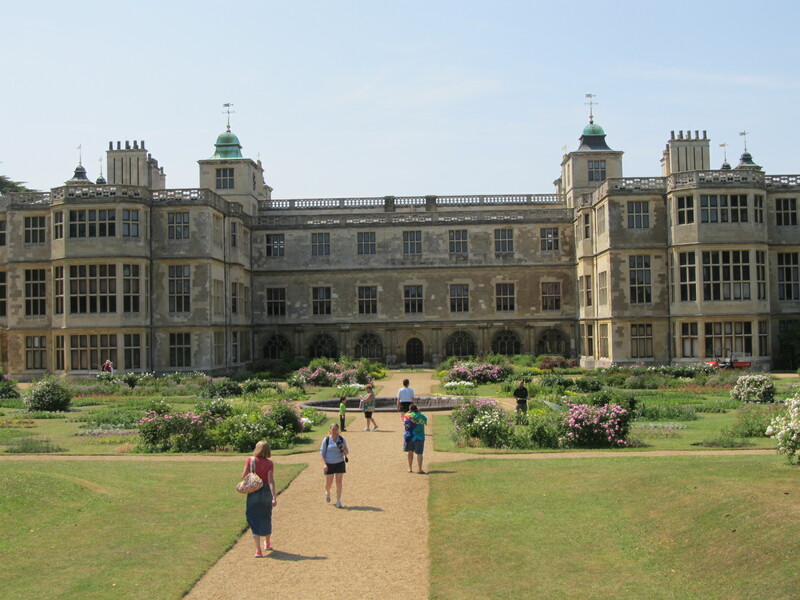 The fantastic classic Tudor houses. 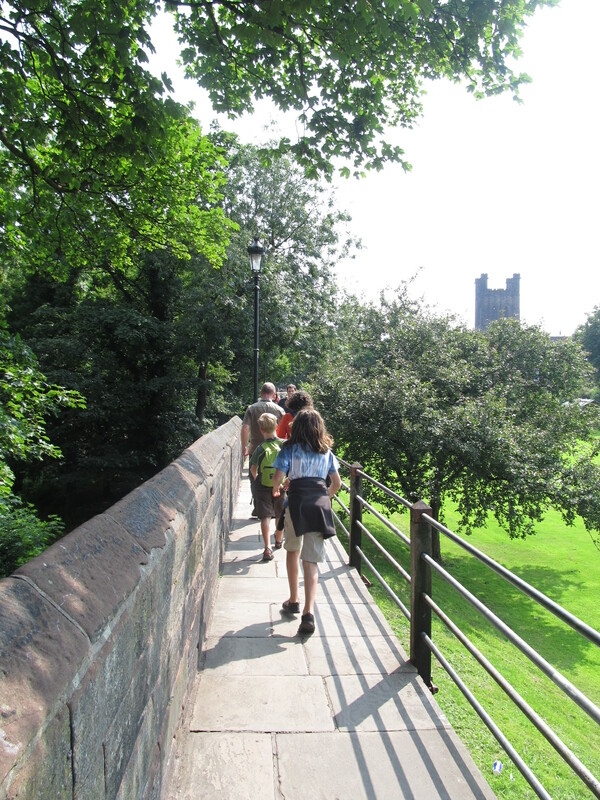 We saw the Roman garden and this, Chester Castle, from the Wall. Charlie and Henry have had a great few (last) days together, after several years of friendship. I know there will be a gap in our lives when we return. Charlie, at least is getting a dog, whom I suggested he called Henry…. 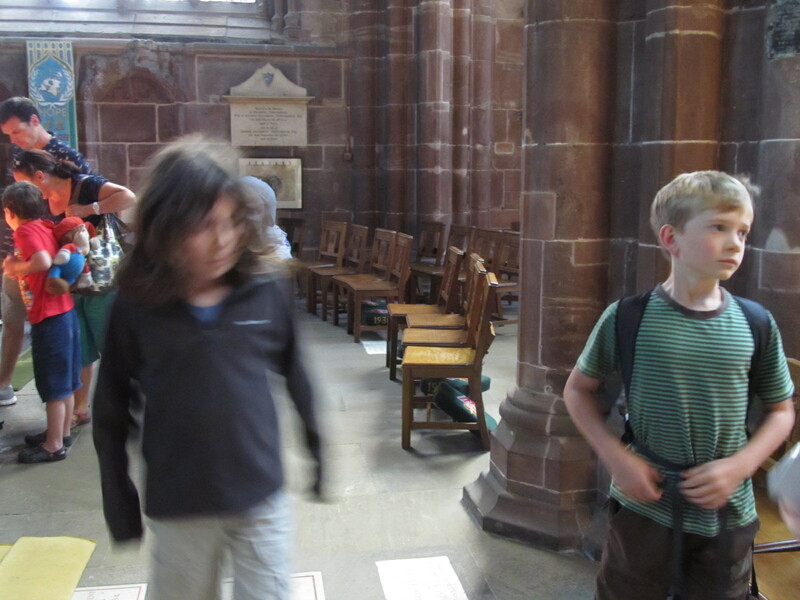 We also saw around Chester Cathedral (‘Churches visited’ is one of the largest on our trip tally), before what was dubbed our “last supper” together. We will miss you guys so much. It has been great to have some time with you on your new (and old) turf. We have so many great memories of the last few years and all the adventures together….I am sure there will be more some day. 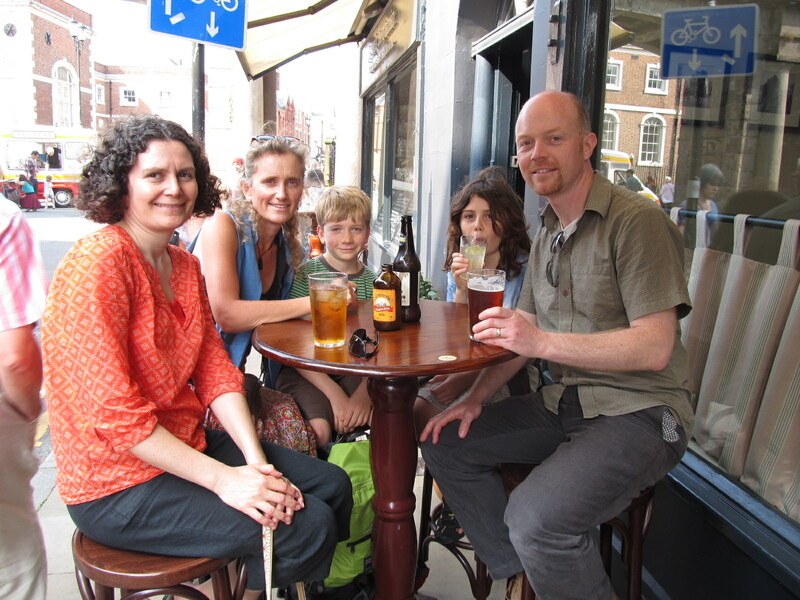 The weekend we left NZ, way back 4 months ago, our very good friends around the corner made the decision to return to the UK after over 5 years of being Kiwis. 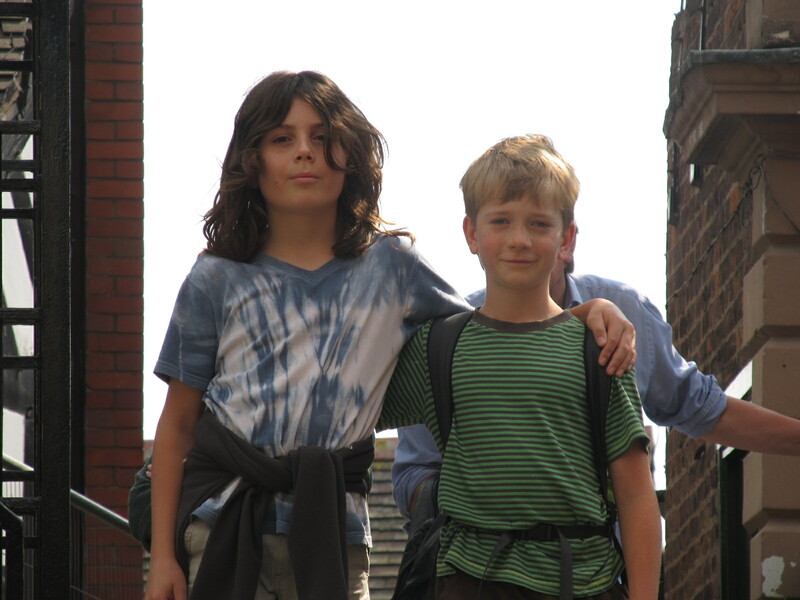 These guys provide not only Charlie’s best mate, Henry, but also much inspiration for adventuring. I think of them as some of my “Huckleberry friends” (from that line in the song Moon River). 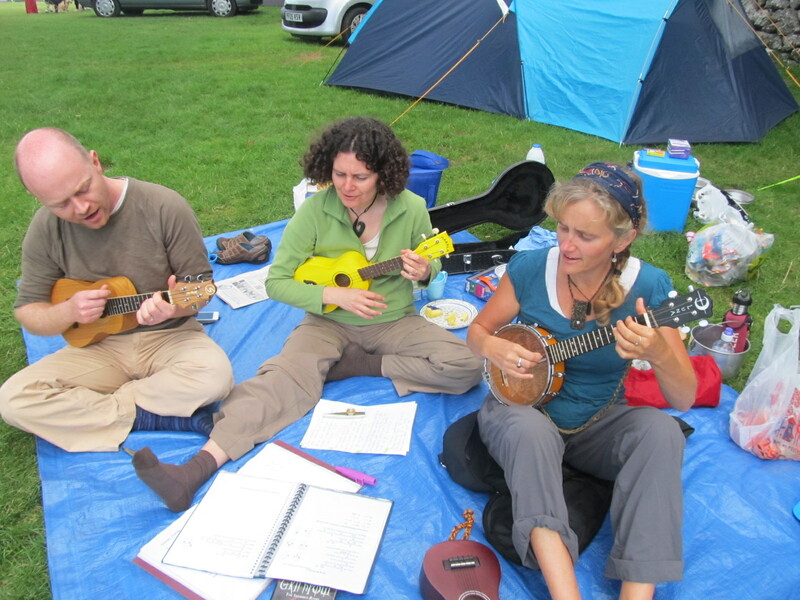 Friends who are always up for a picnic, a camp, an adventure of any sort. So you can imagine how sad we were when I heard via skype, of their intentions. But every cloud has a sliver lining. The gods of selling houses, furniture and packing up were in top form working smoothly with them safely to blighty’s shores while we were still here. In the midst of trying to buy a car, a house & a new life….they managed to come camping with us and we spent maximum time together, especially for the boys to play. 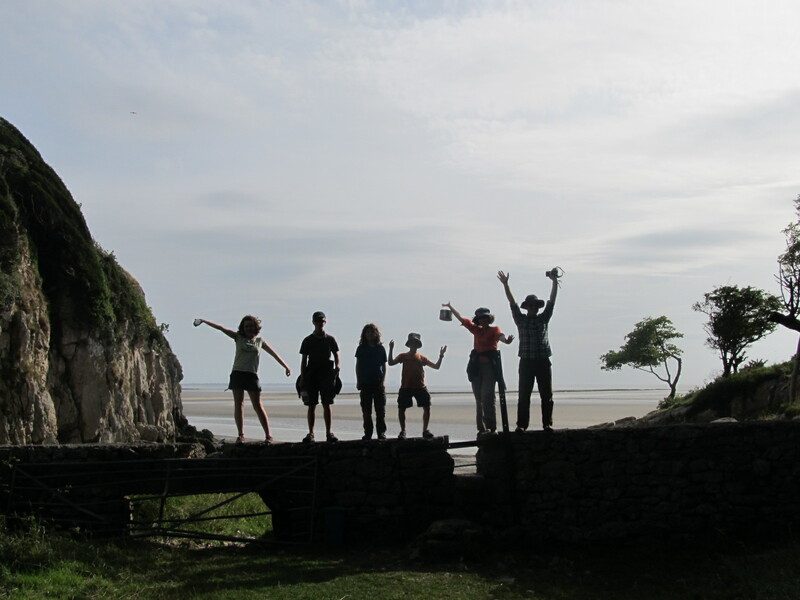 We stayed in a great camp with a coast, forest, large rocks, a cave and a gang of other boys. (South of the Lake District, Northern Lancashire). I will hardly mention the weather…only a couple of hours of rain the whole three days!! 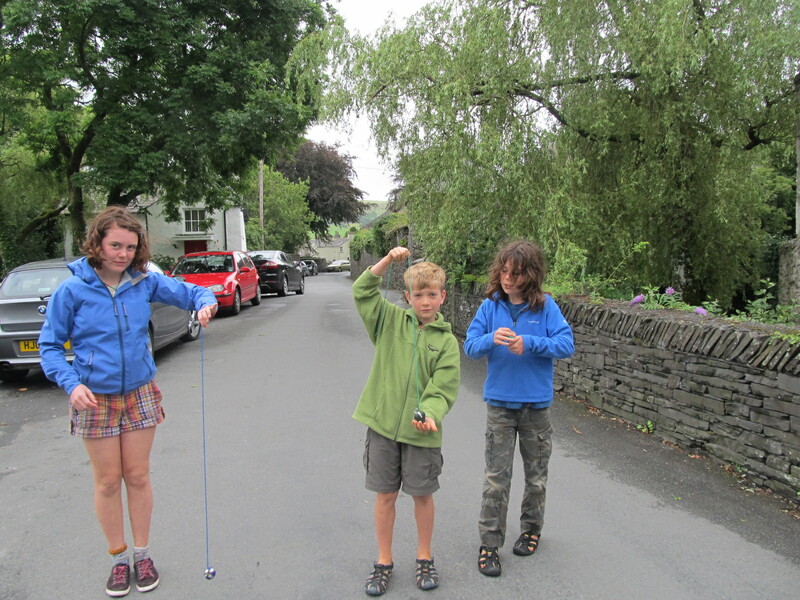 We explored nearby Cartmel, a gorgeous old village with an equally old Priory where we had a tour. 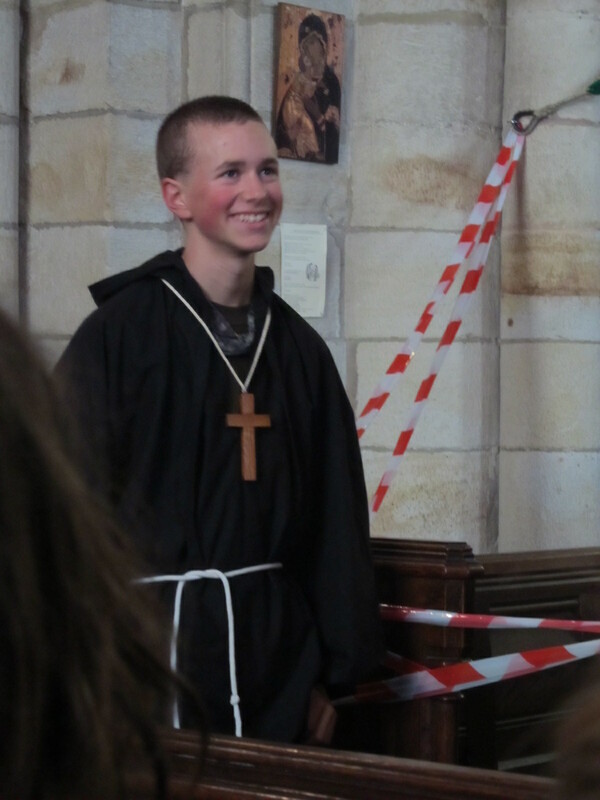 Ollie volunteered to dress up as a monk. Bless him. We had some great walks including the Fairy steps. 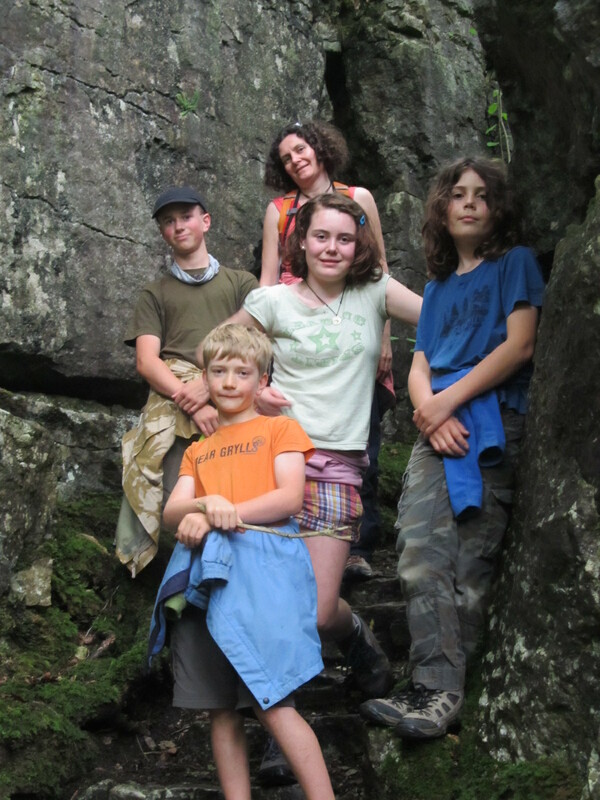 Walking up the narrow coffin route on carved stone steps was a challenge – if you could do it without touching the sides you would see a Fairy at the top though. Instead of fairies there was a tree that had coins wedged into it’s trunk. the kids all thought this was something to do with fairies and whipped out pocket knives to add their own coins. Did I mention that we also play music together too?? We walked up hills and around a lake. 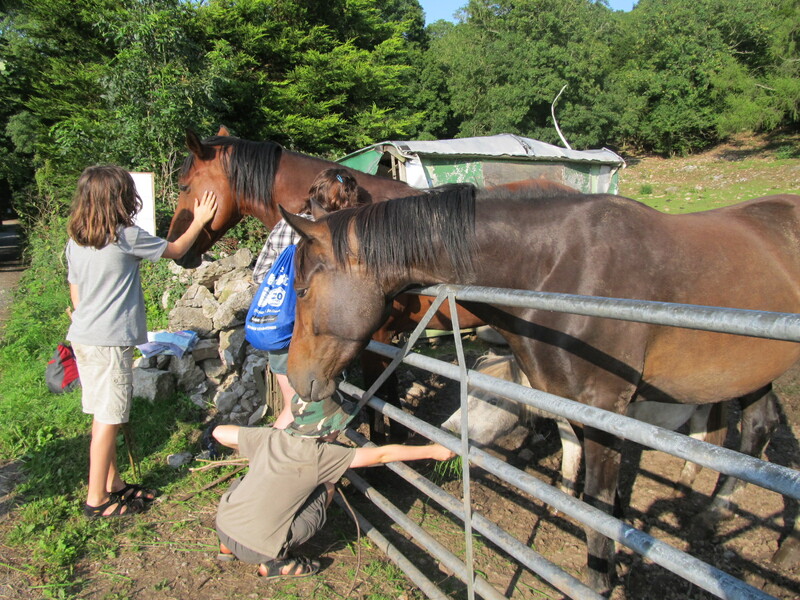 We pigged-out on blackberries which grow everywhere….the kids even fed them to these horses…. 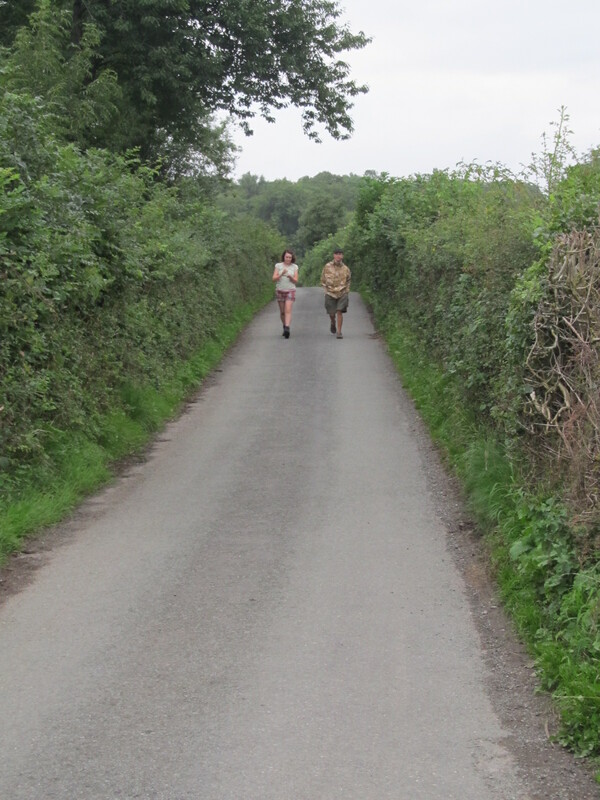 Ambled down country lanes (more blackberries)…. 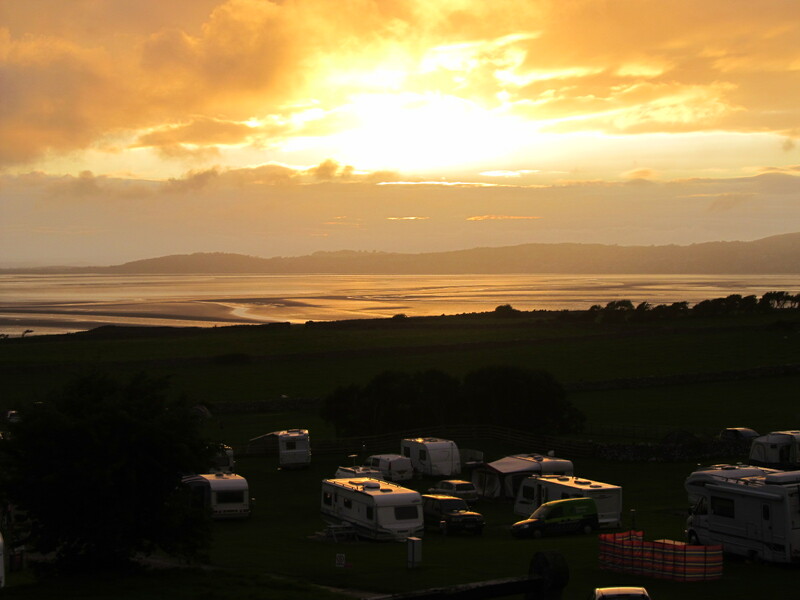 And enjoyed this view from our camp. 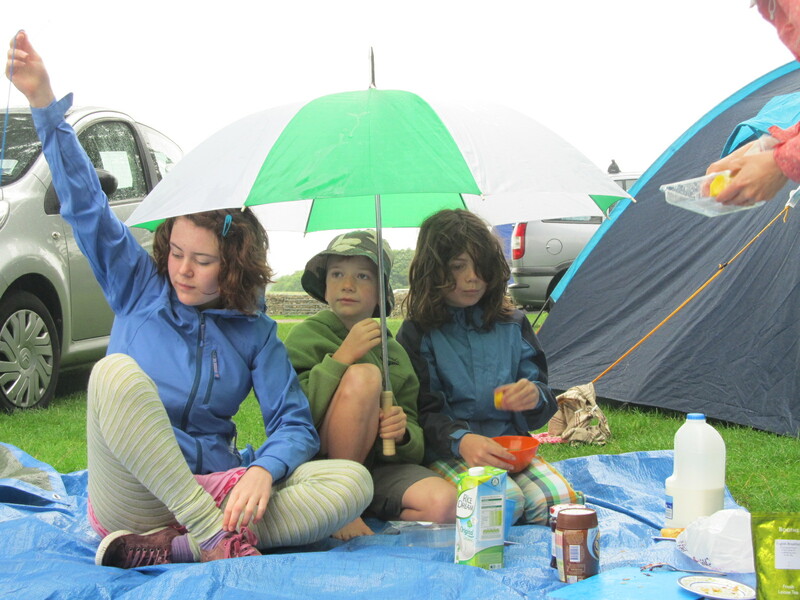 We laughed, played games, cooked amazing meals with the absolute minimum of (borrowed) camping gear and made plans for future adventures…. 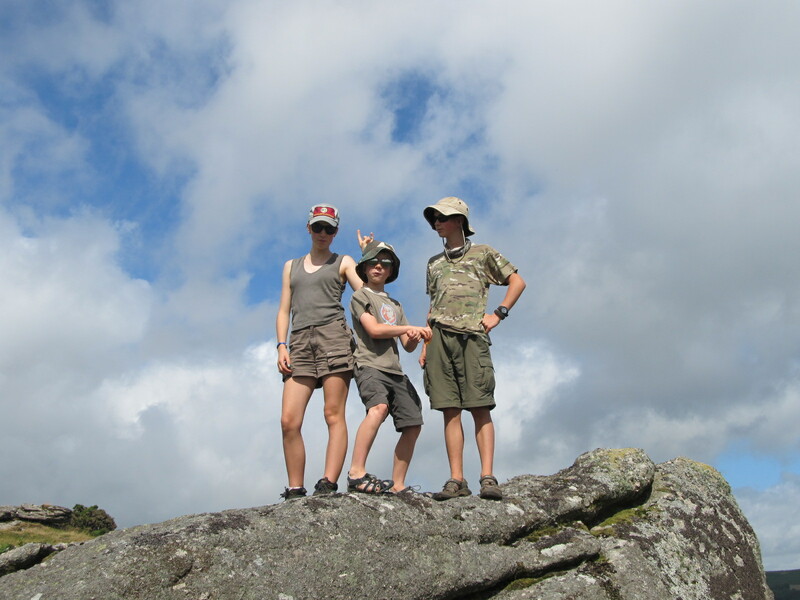 Kia Ora, I'm Jane, mother to three wonderful children, living the dream in New Zealand. 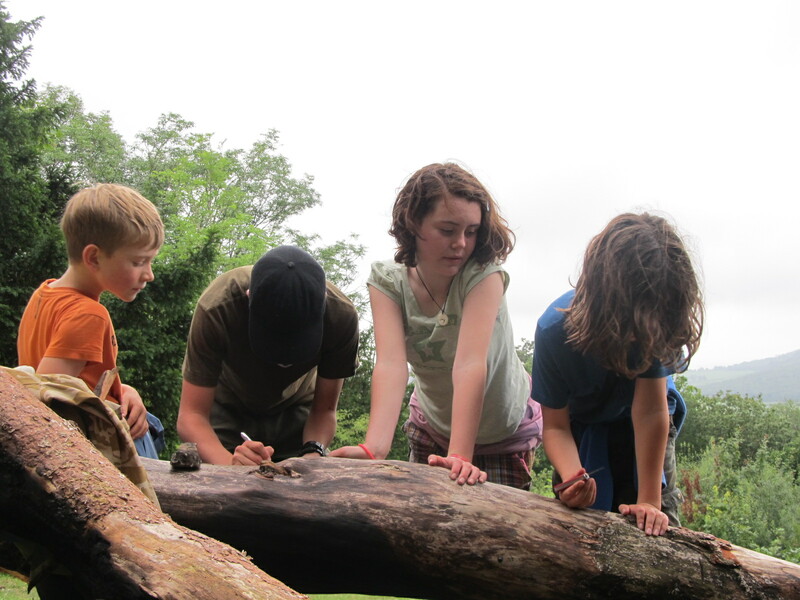 This blog is for sharing our everyday life and our journey of natural living and learning. A dream 9 years in the making….